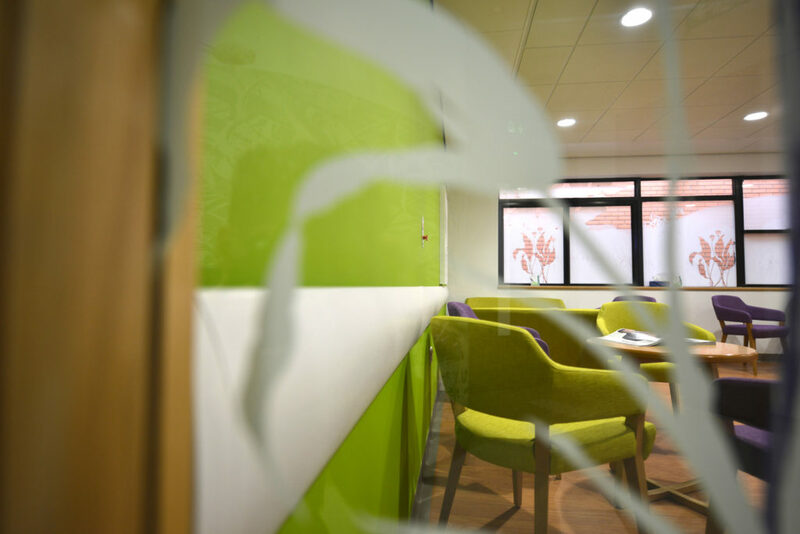 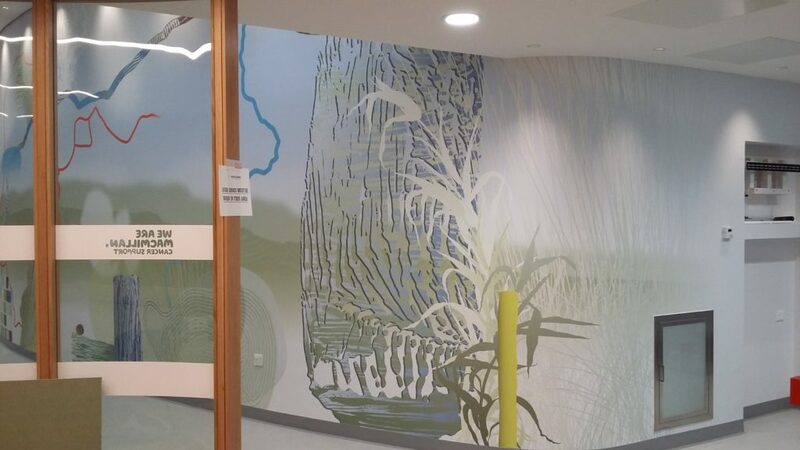 Some brilliant new images of my project for the new Macmillan Unit at Tameside & Glossop Integrated Care NHS Foundation Trust have come to light. 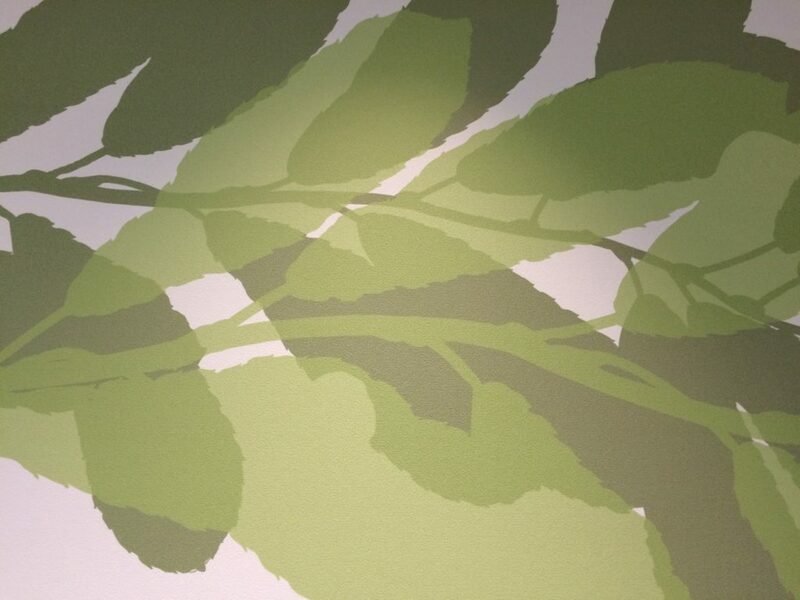 It is always refreshing to see how others see your work & the space it was created for. 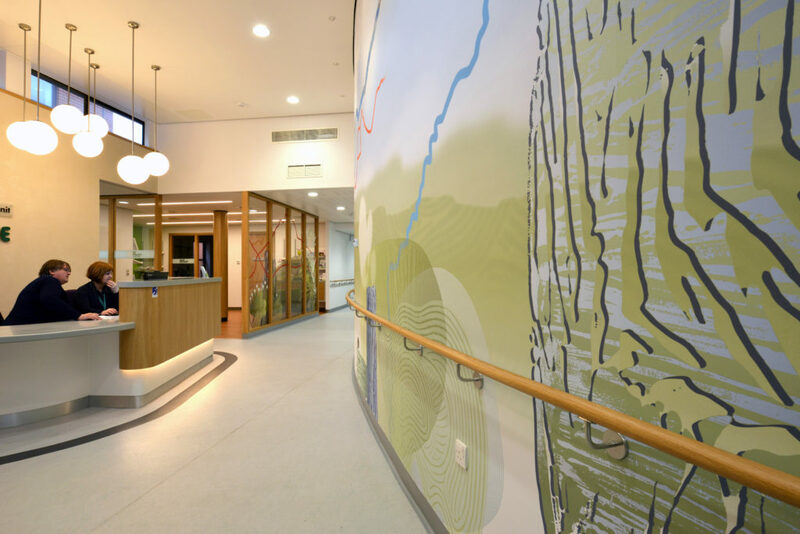 In this instance I was very kindly given permission by Mike Hearle, European Digital Marketing Manager for Construction Specialties – to use images from their website. 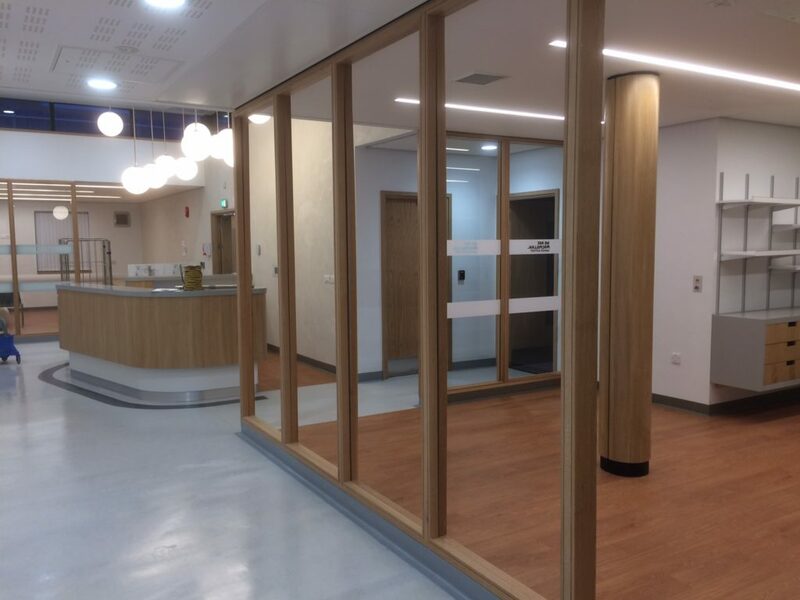 Construction Specialities supplied and installed the solid timber handrails running through the unit. 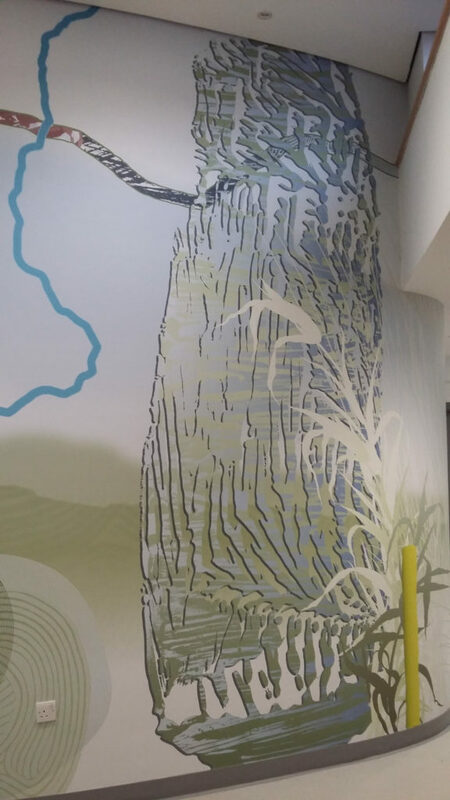 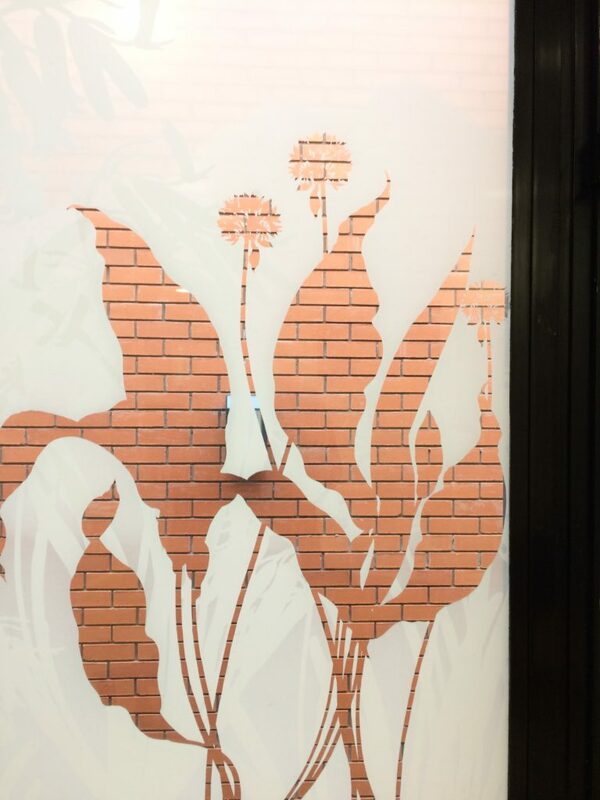 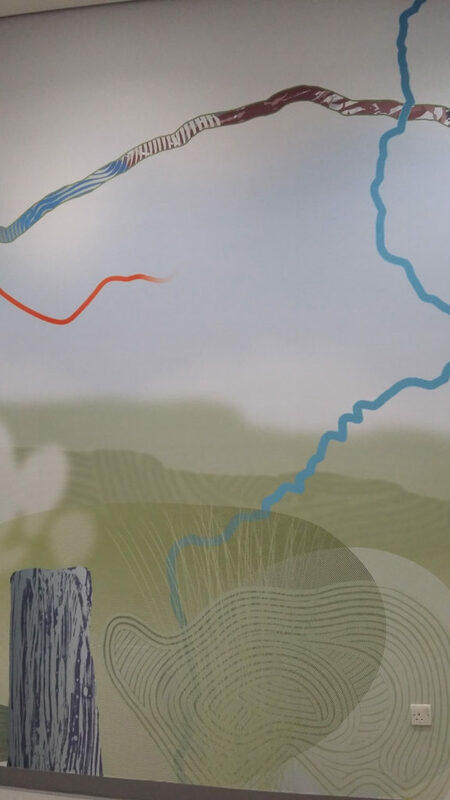 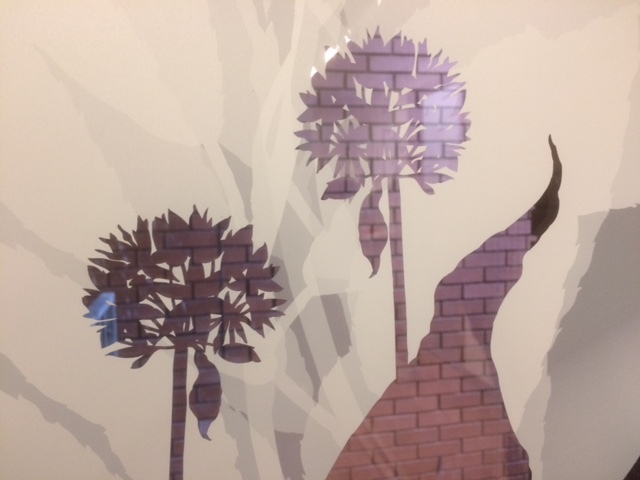 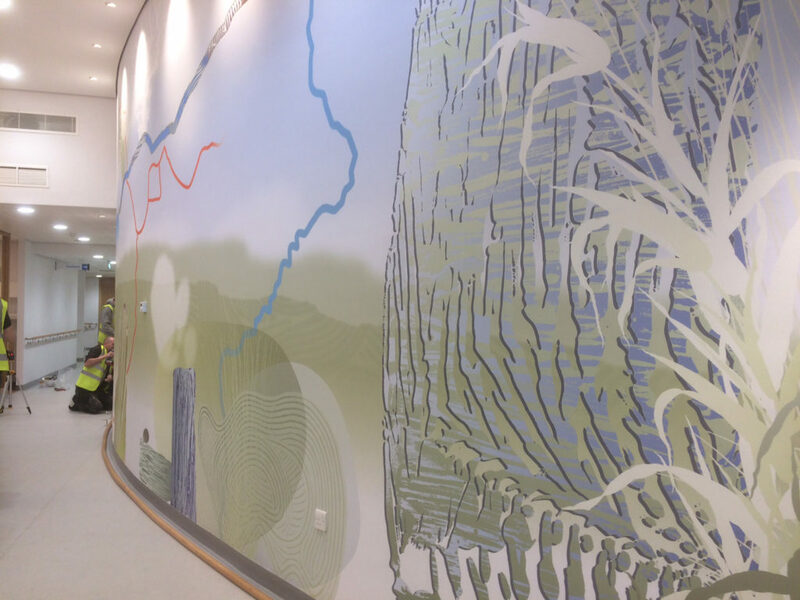 Take a look …the artwork was digitally printed and installed by VGL. 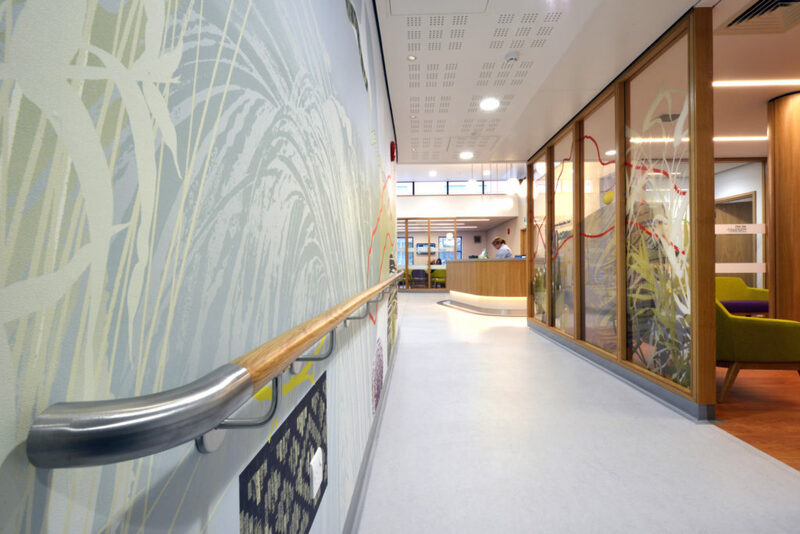 The project was delivered by IBI Group Architects and Willis Newson, the UK’s leading arts and health consultancy. 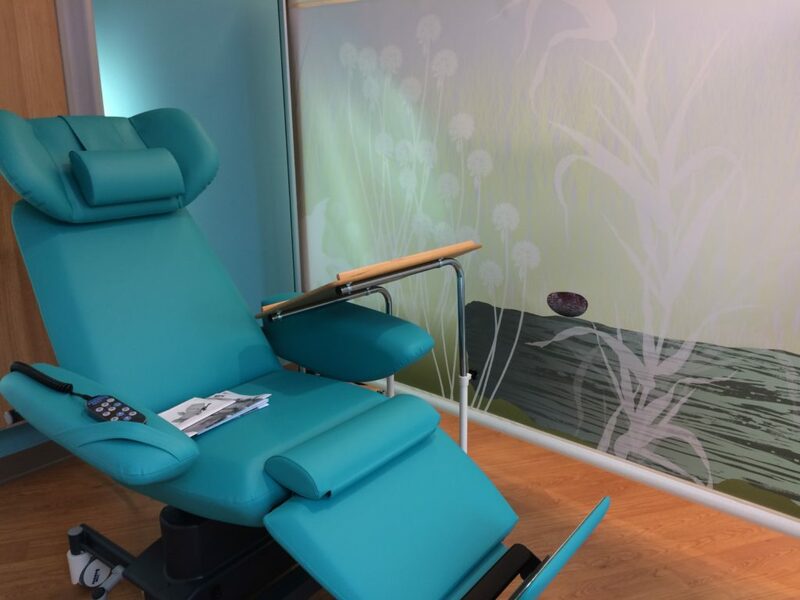 The Chemotherapy Treatment Room. 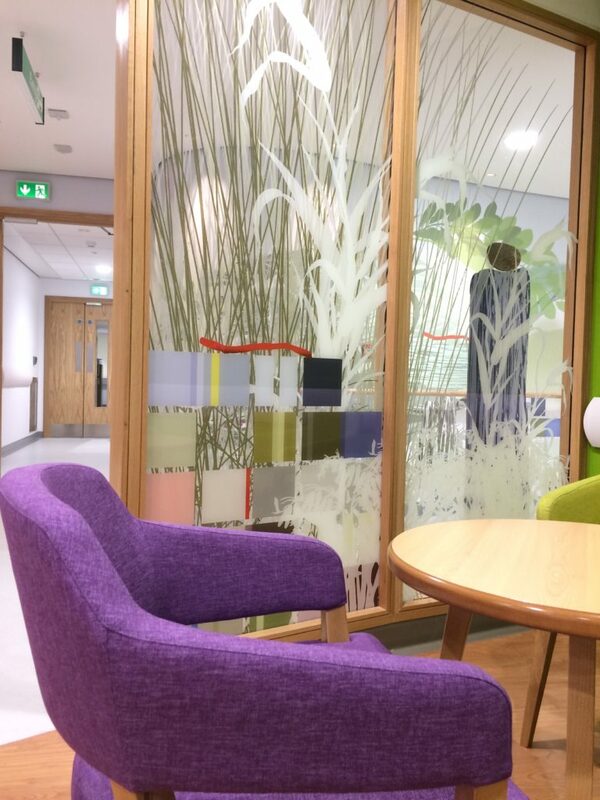 During my last visit to site on 13th March 2017 – I was really interested to see how the creative concept for the project had been applied in the Chemotherapy Treatment Room – a state of the art, 6 chair Chemotherapy Suite. 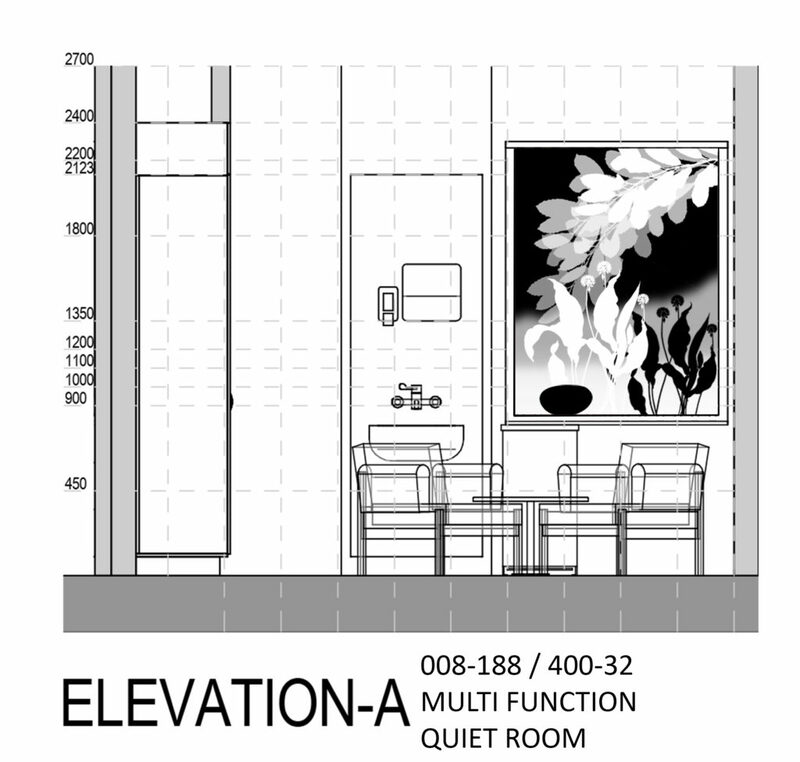 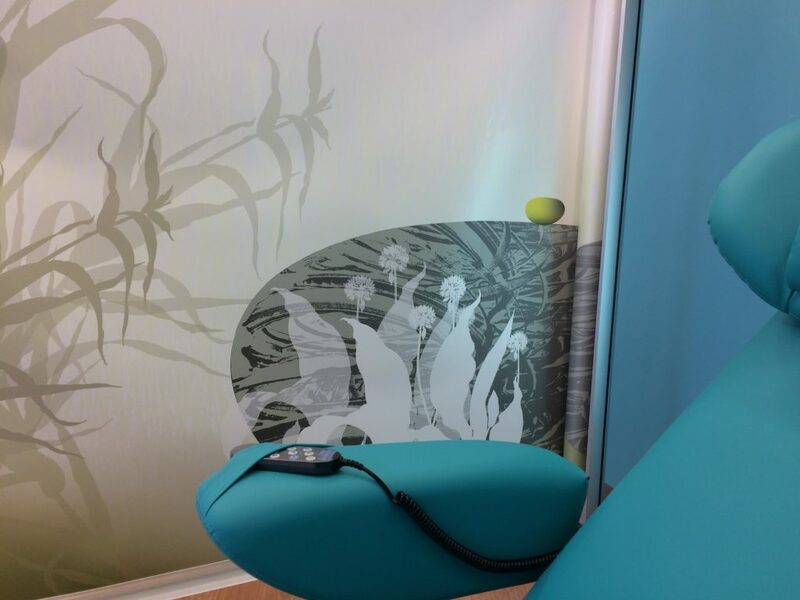 The artwork was to be applied to the adjustable privacy screens adjacent to each chair. 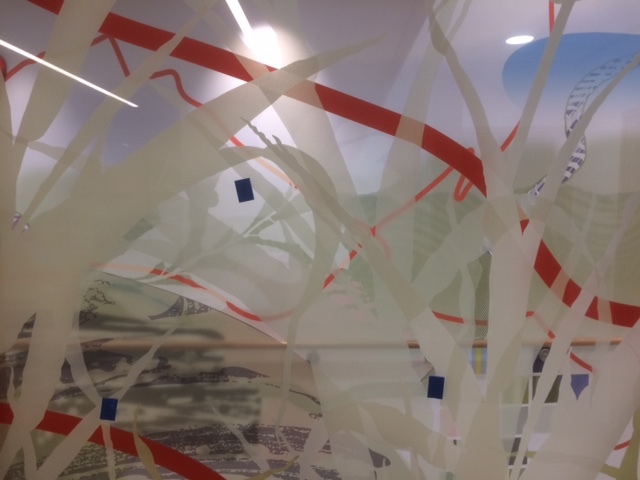 The work forms a continuous landscape, divided into 6 sections, which will be continually re-arranged to present new combinations as the screens are used throughout the day. 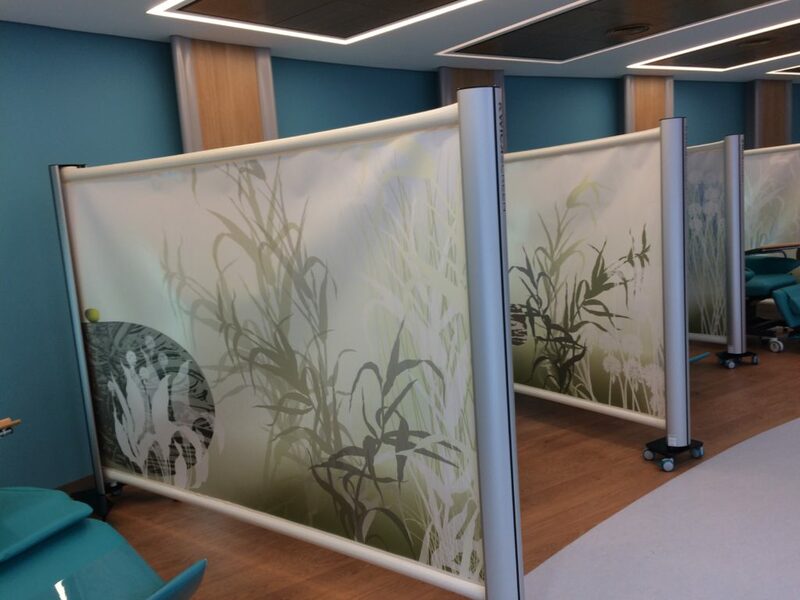 These screens were manufactured and installed by Kwickscreen. 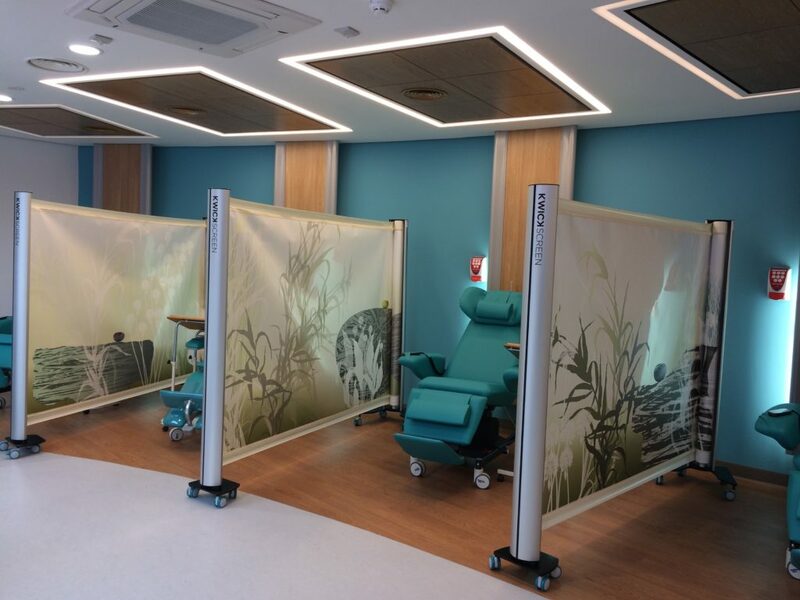 The Christie Hospital has also launched a 3 day a week chemotherapy service at the new £1.8m Macmillan Unit. 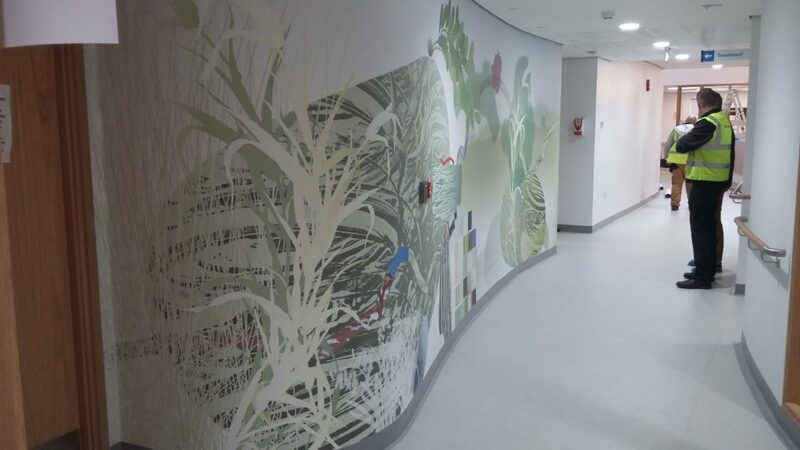 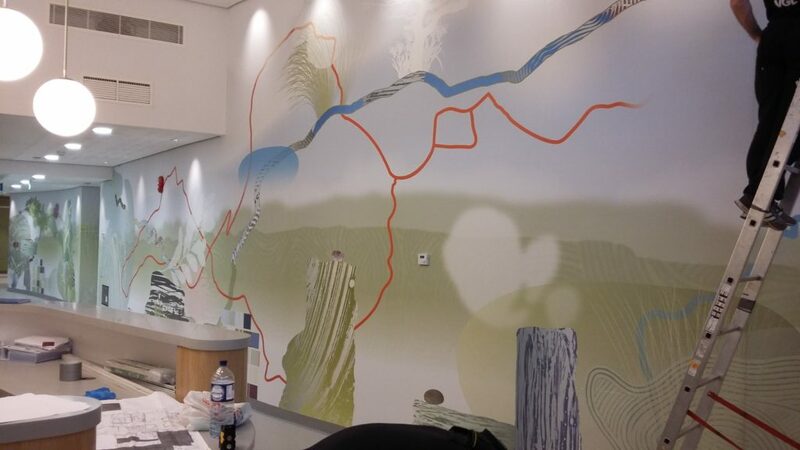 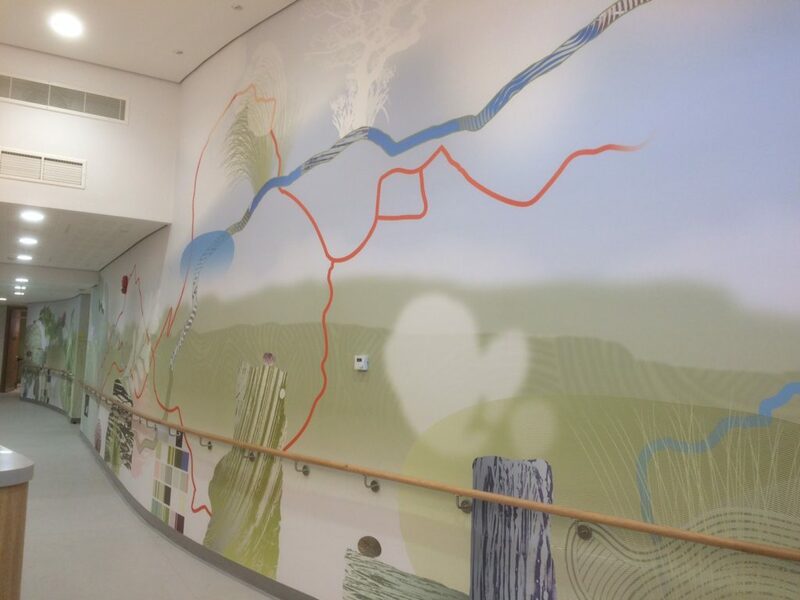 Main Corridor Artwork … nearly there ! 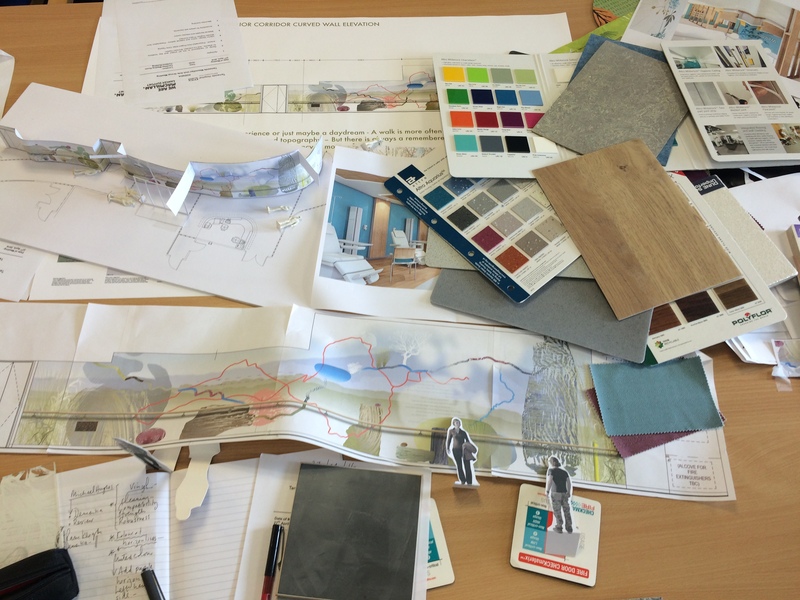 I know that this has been a rather long session of recent postings – but I am in ‘catch-up’ mode and before the new unit opens I wanted to get as much of the project documented, so bear with me if you can ! 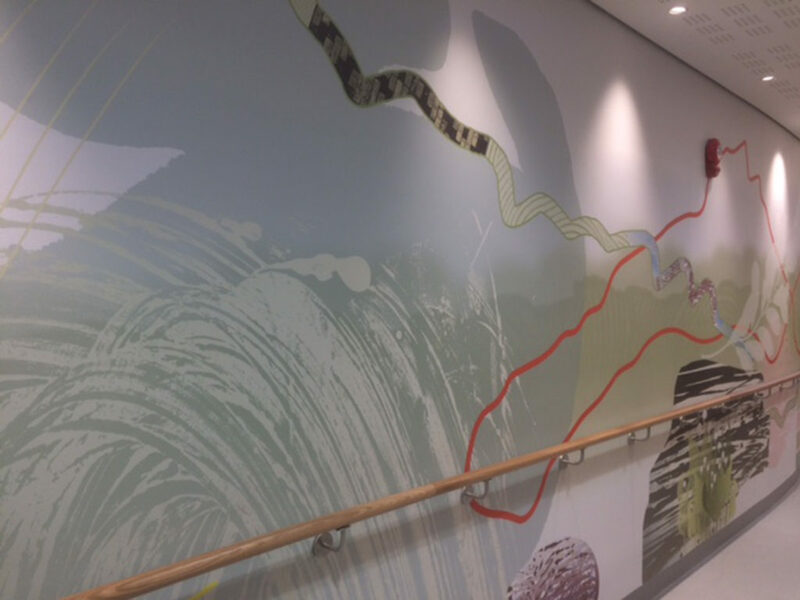 By far the most visible of the installations being delivered is the large scale bespoke ‘landscape’ running the length of the new corridor space. 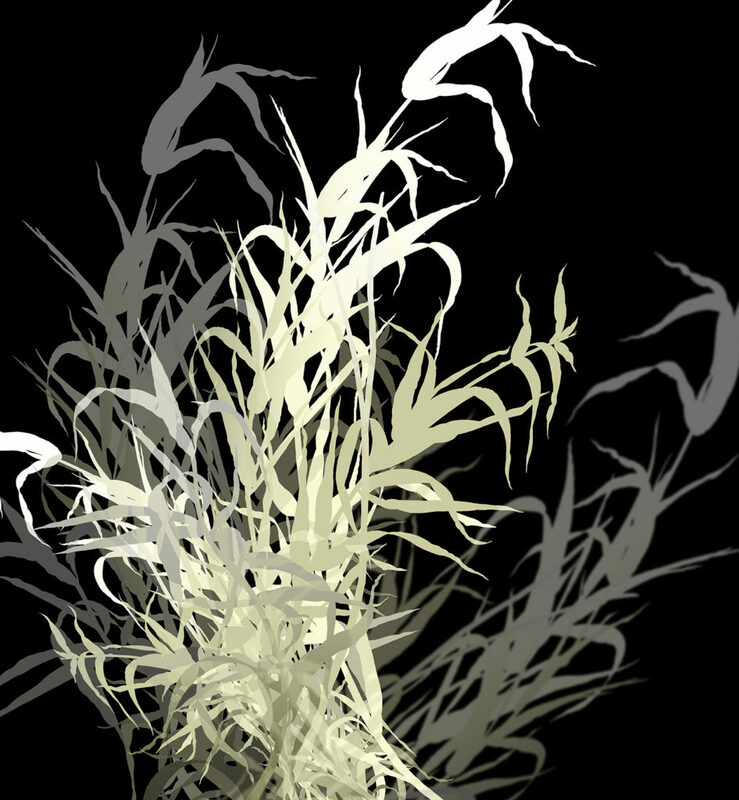 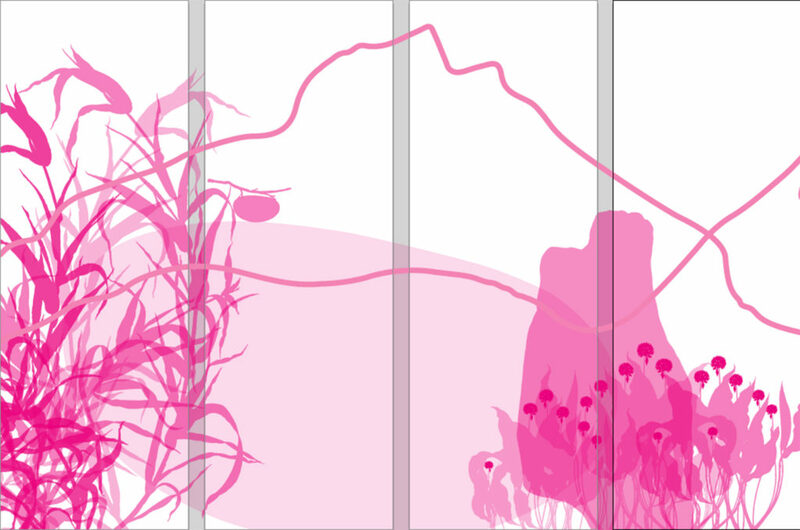 This artwork is not a linear narrative, so can be experienced from whatever direction you are walking in. 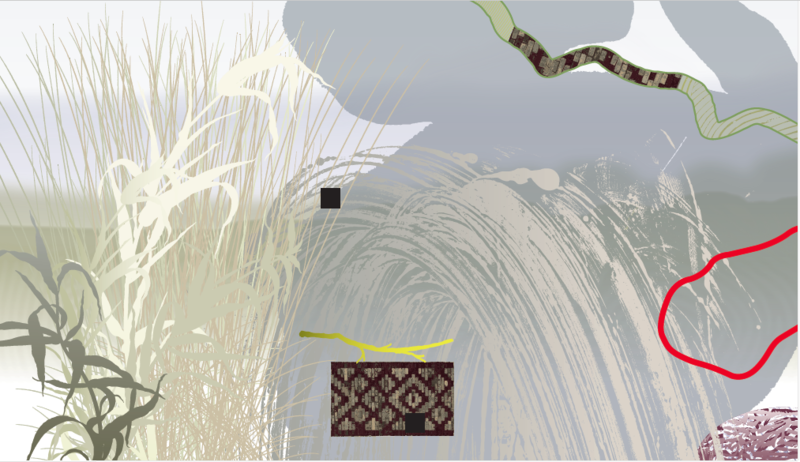 It isn’t a conventional landscape either, with a foreground, horizon and expansive sky. 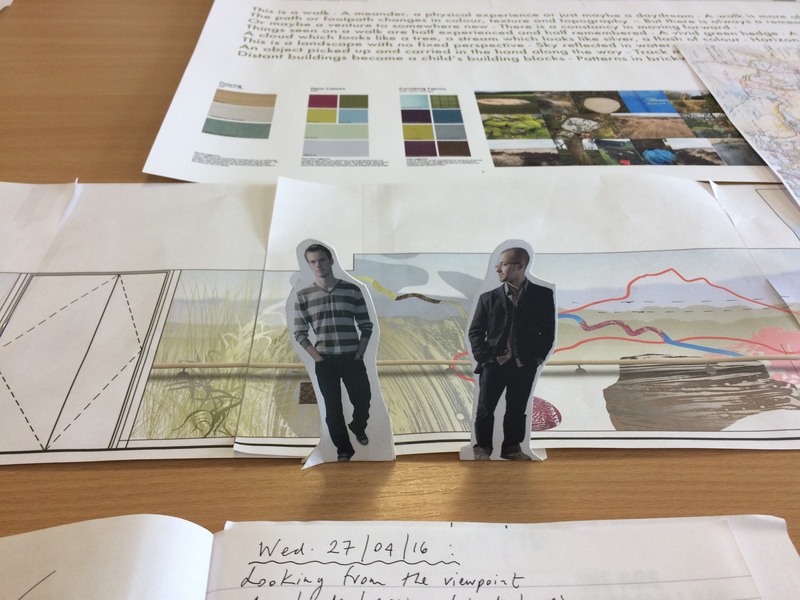 It may have elements of this about it – BUT, the original walk I made with Stewart Ramsden into the Landscape of Tameside was only the beginning of a creative process and the development of a descriptive iconography which could help to tell a story about a journey. 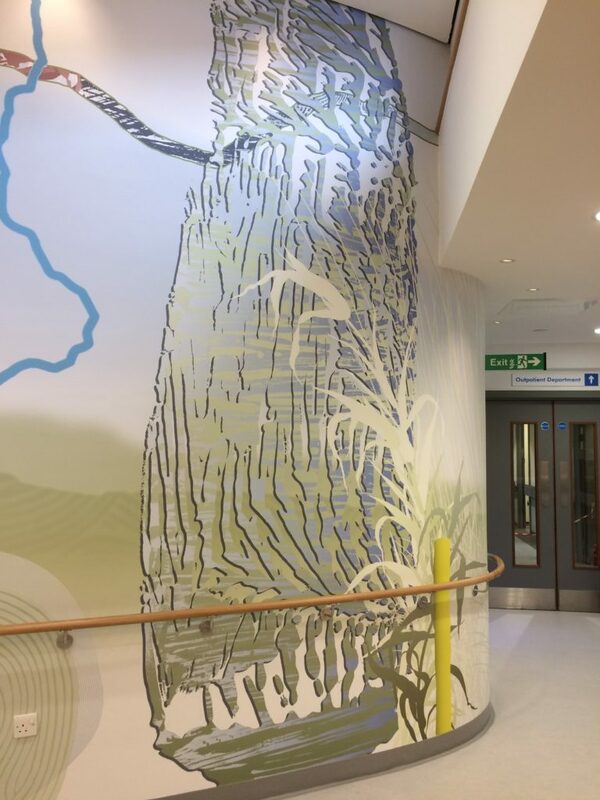 The artwork was developed, manufactured and installed by VGL Ltd. 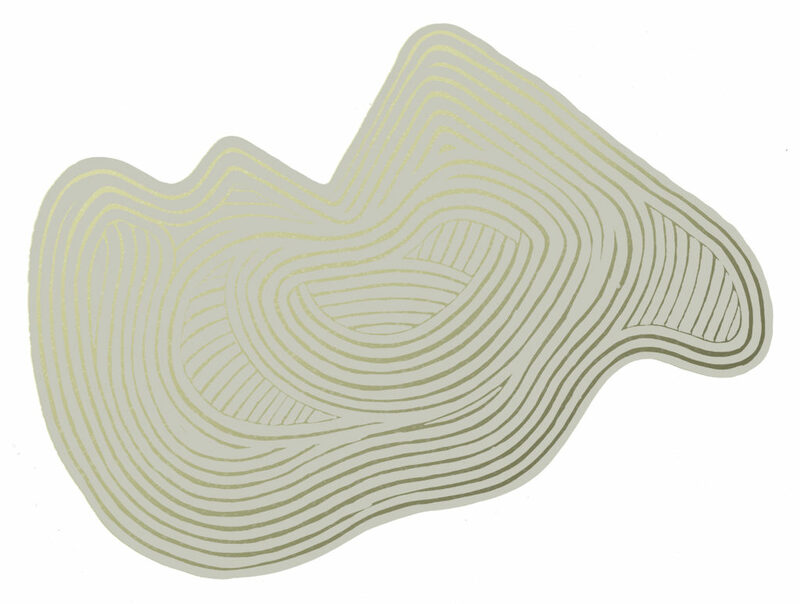 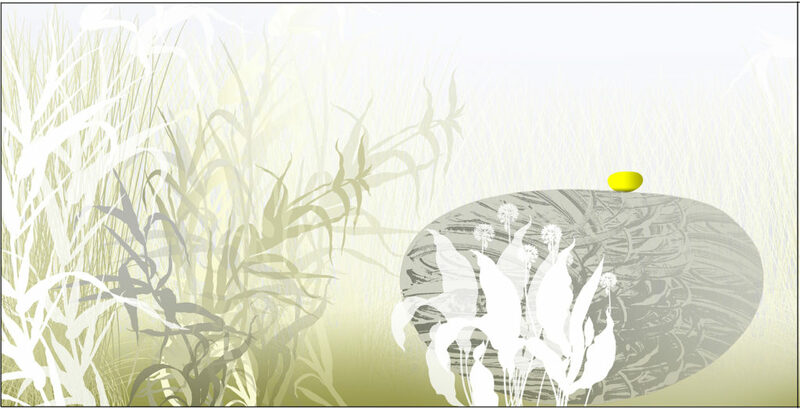 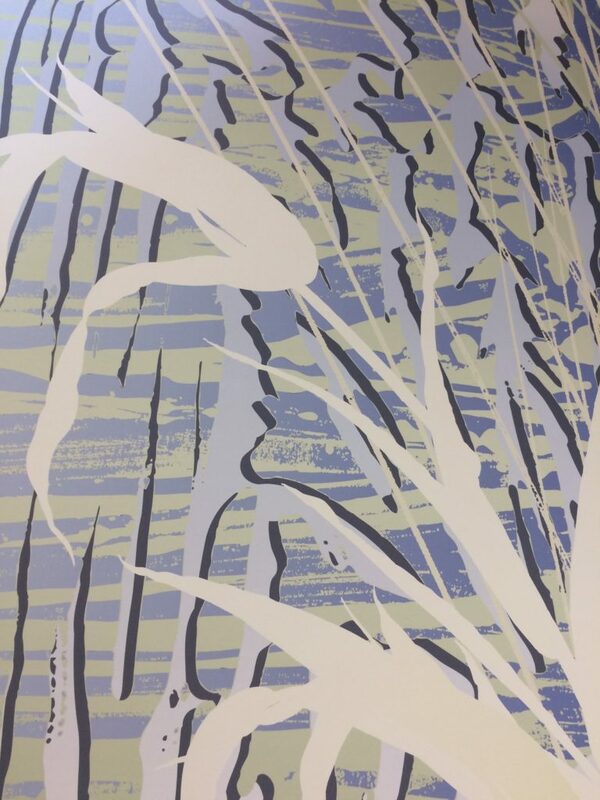 The work is printed onto Dreamscape Suede Wallcovering which has a Poly Cotton fabric backing. 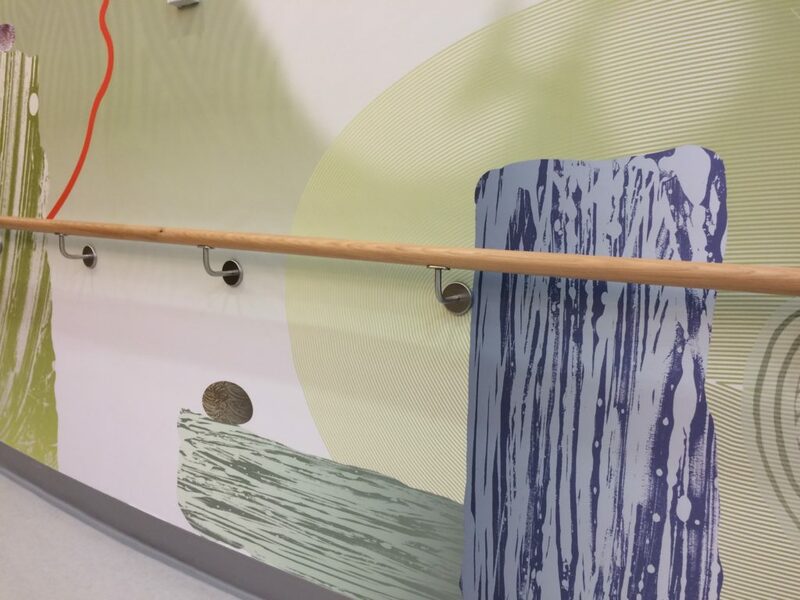 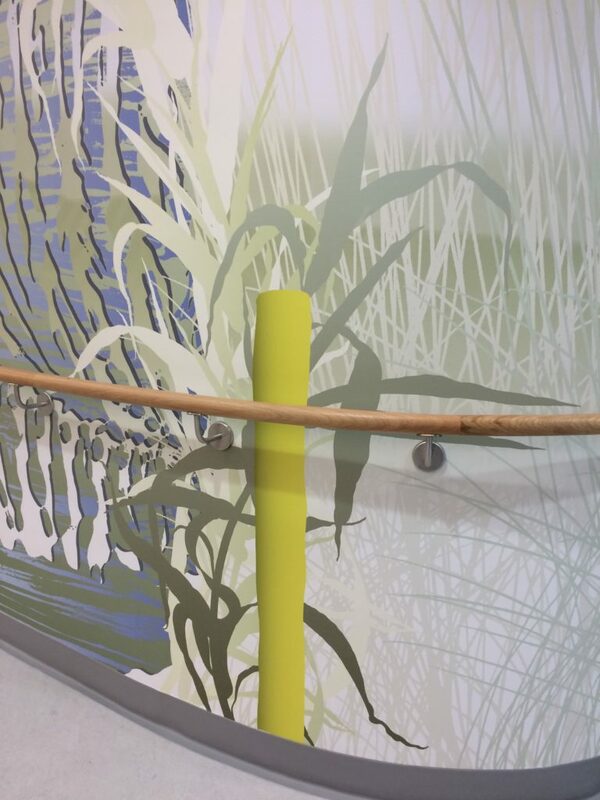 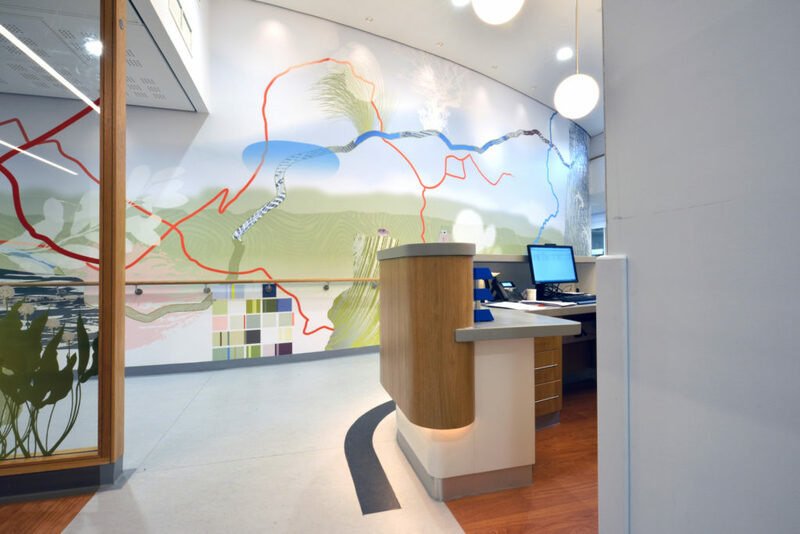 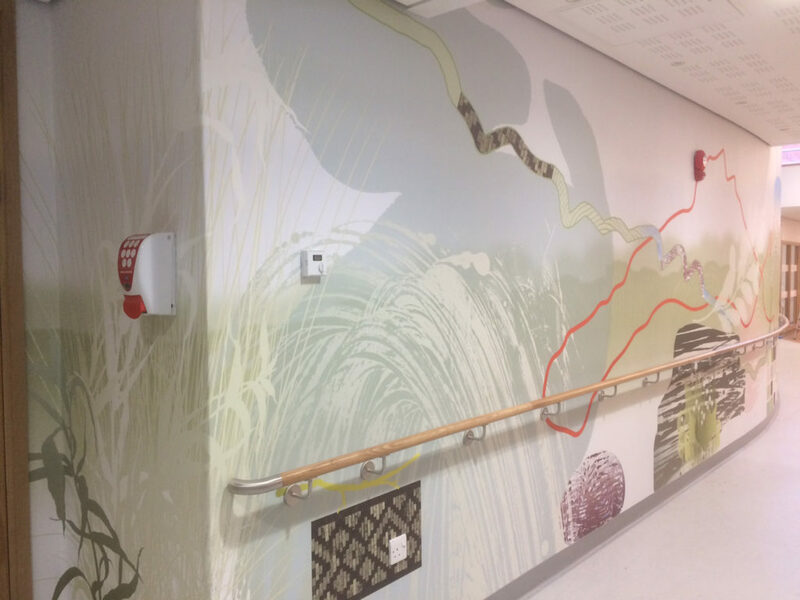 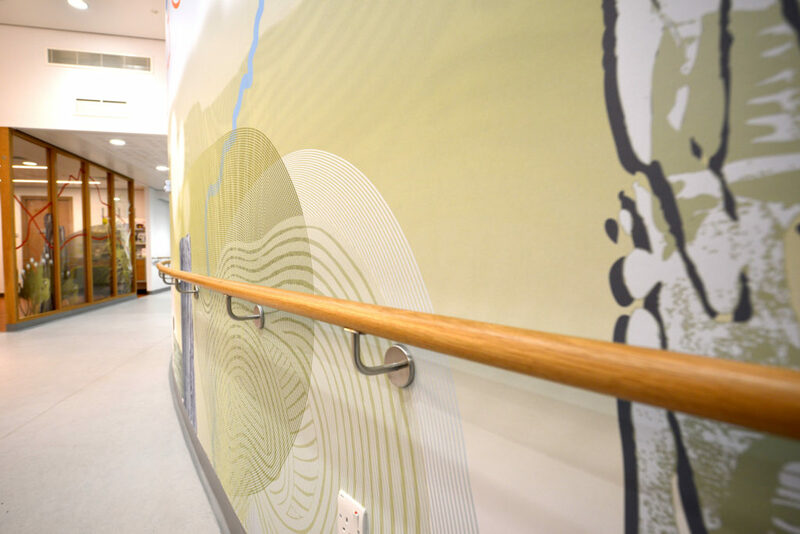 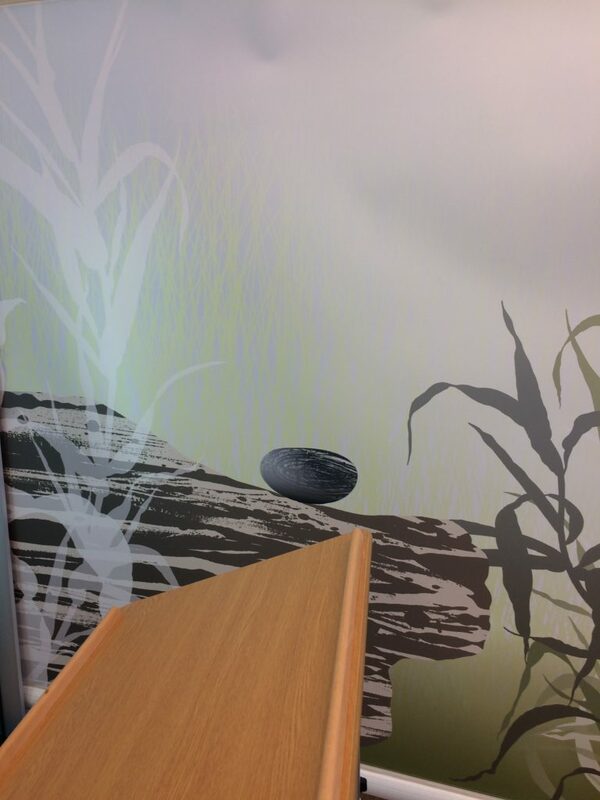 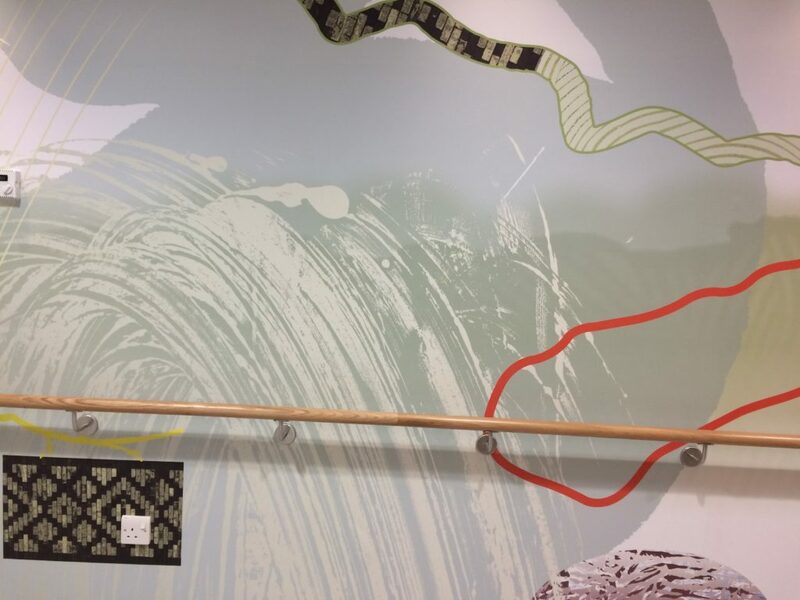 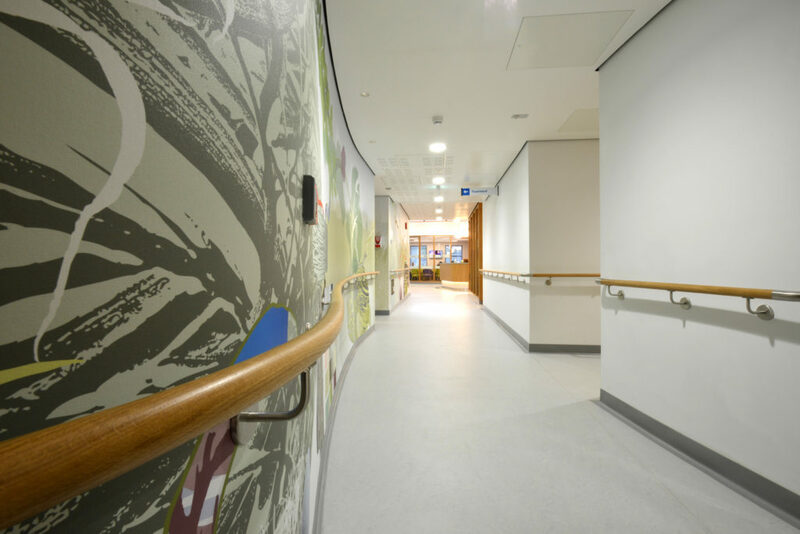 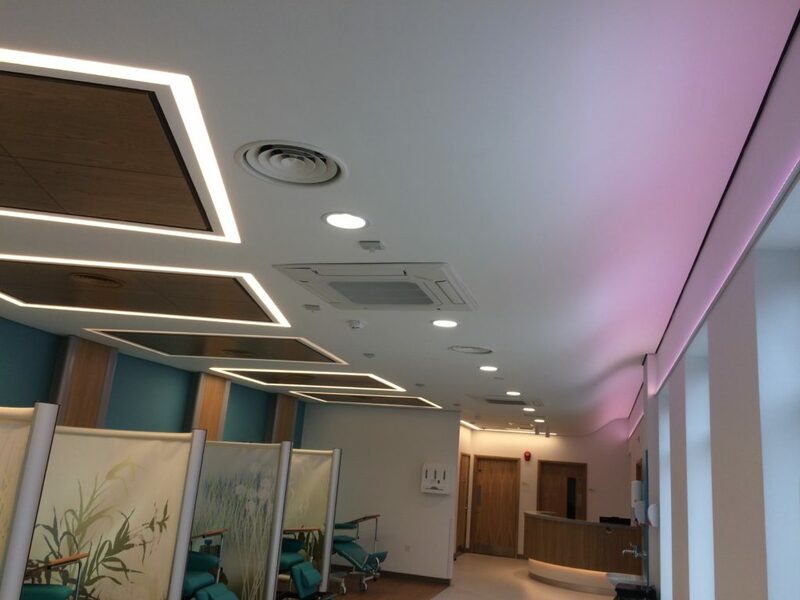 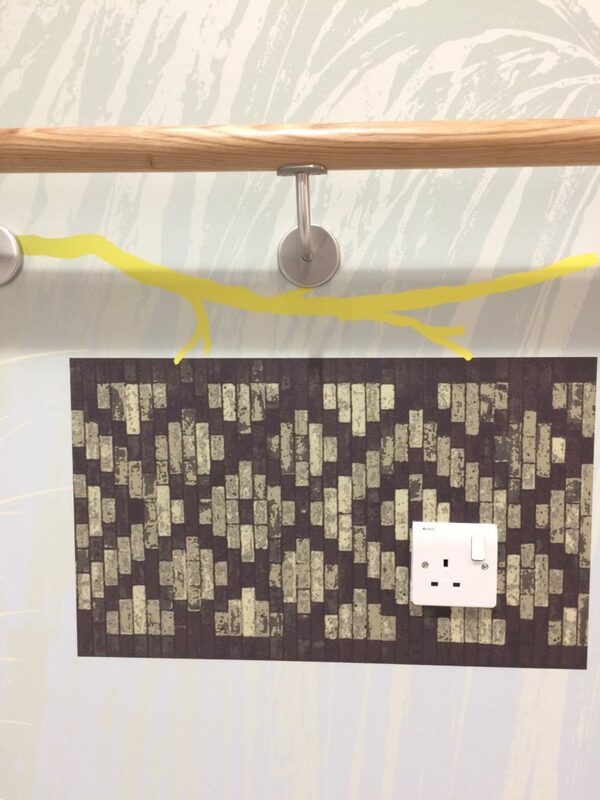 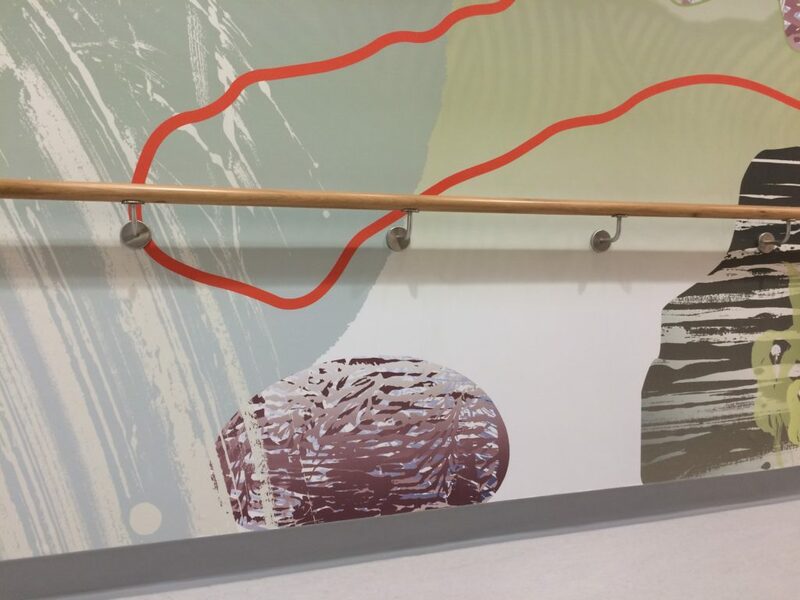 The design work was extensively sampled, with sample installations being carried out at the Hospital – as you can see from the following images. 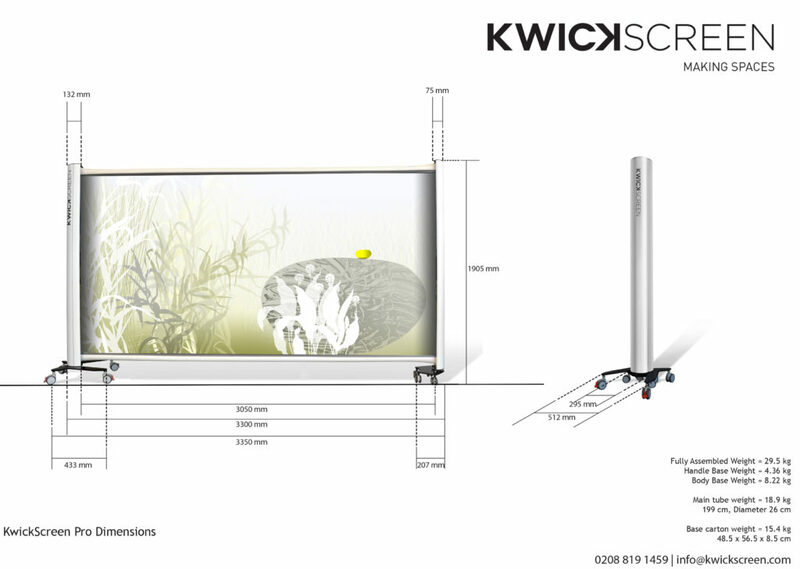 Where necessary the design was then tweaked to fit following comments before finally being approved for full printing and manufacture. 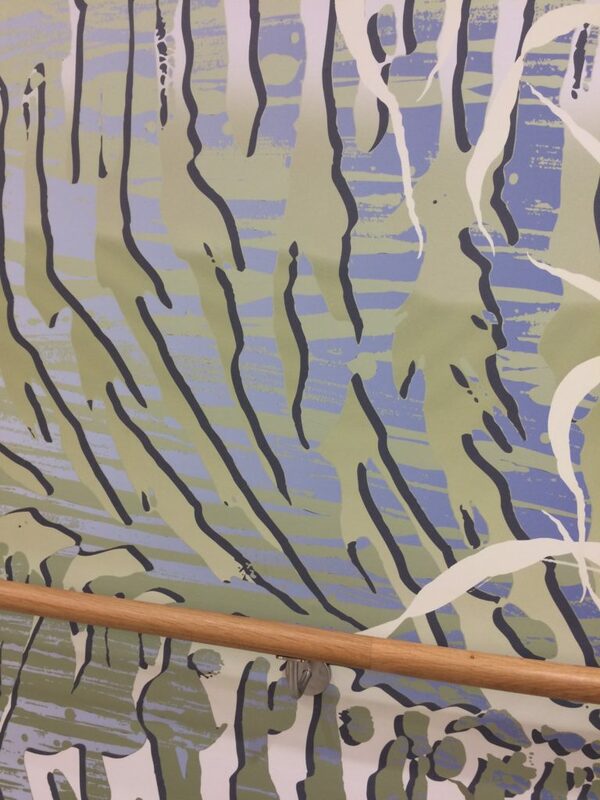 Following approval of the strip samples, a full scale print run started and was installed on site for further comment and review / approval. 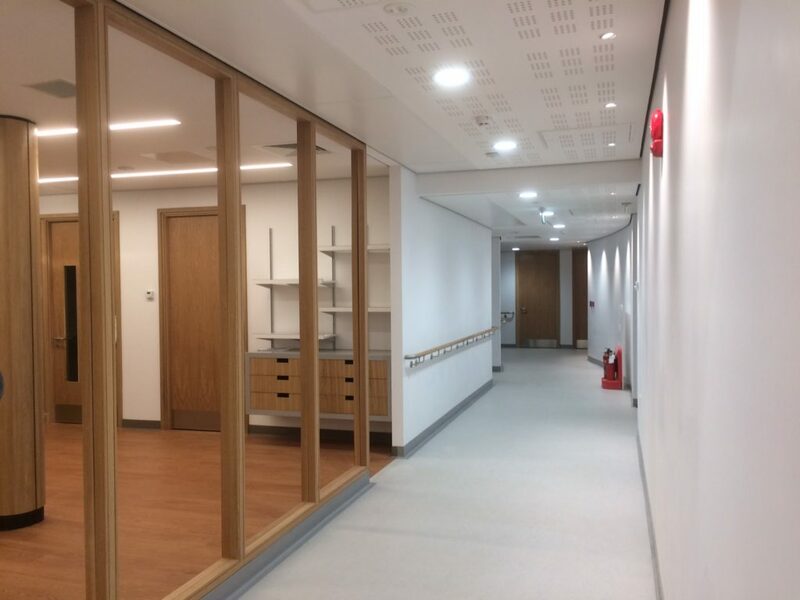 Along the main corridor within the new unit are a series of rooms for staff, service users and their families, consulting and treatment spaces. 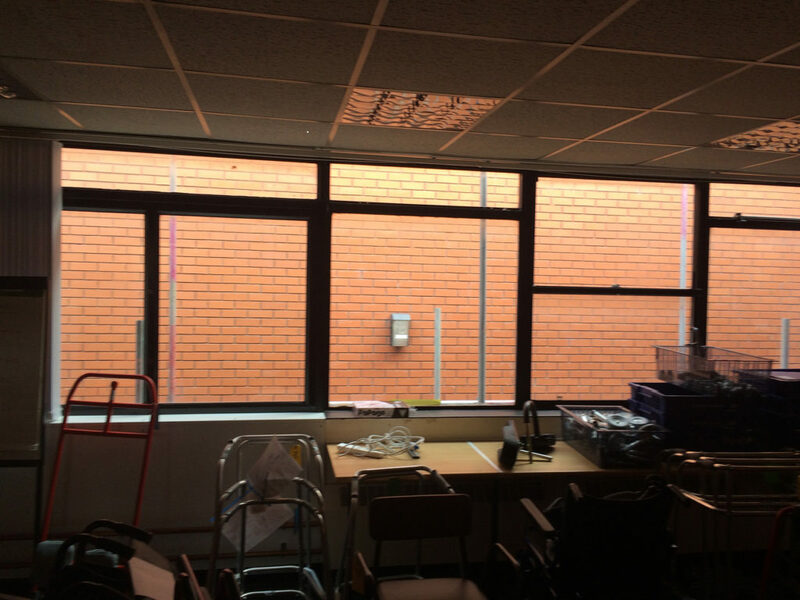 Almost all of these rooms look out onto a blank brick wall of an adjacent building about 1.5m from the windows. 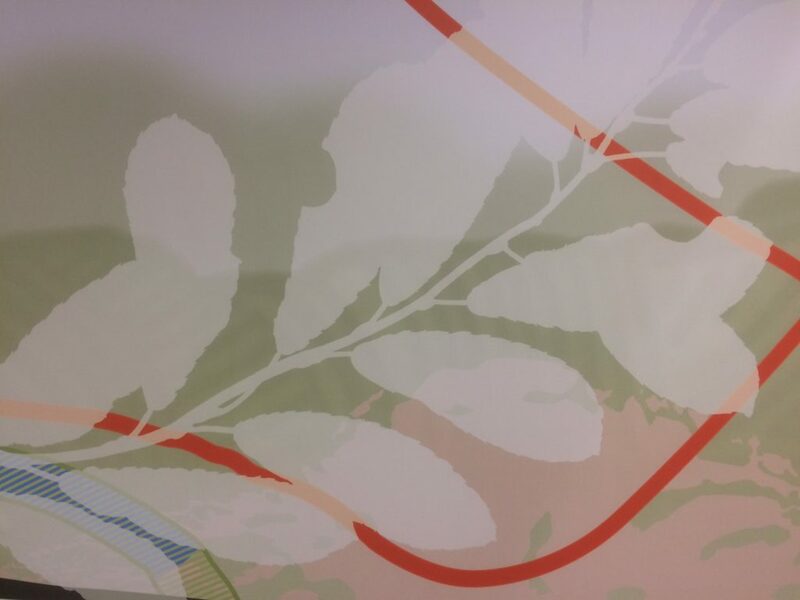 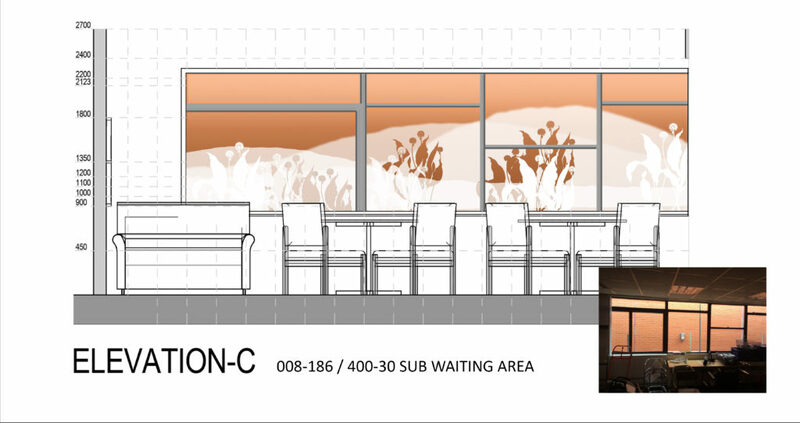 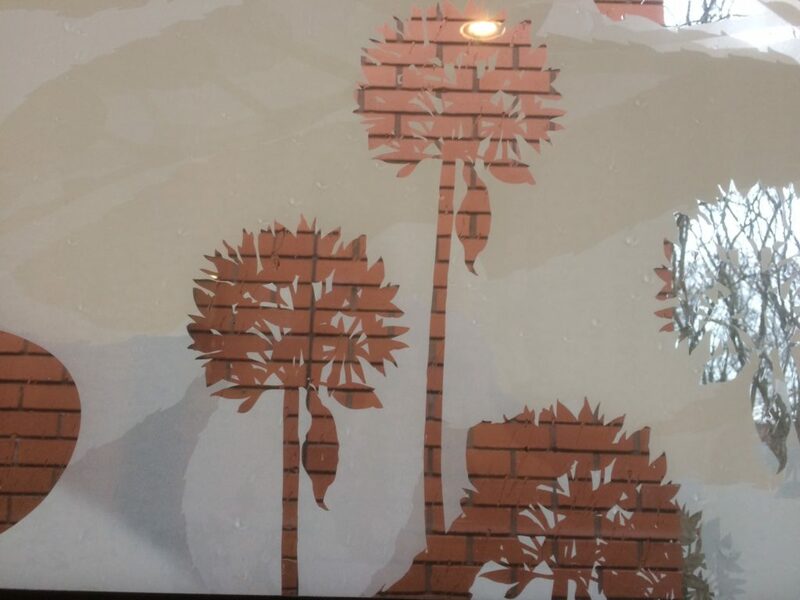 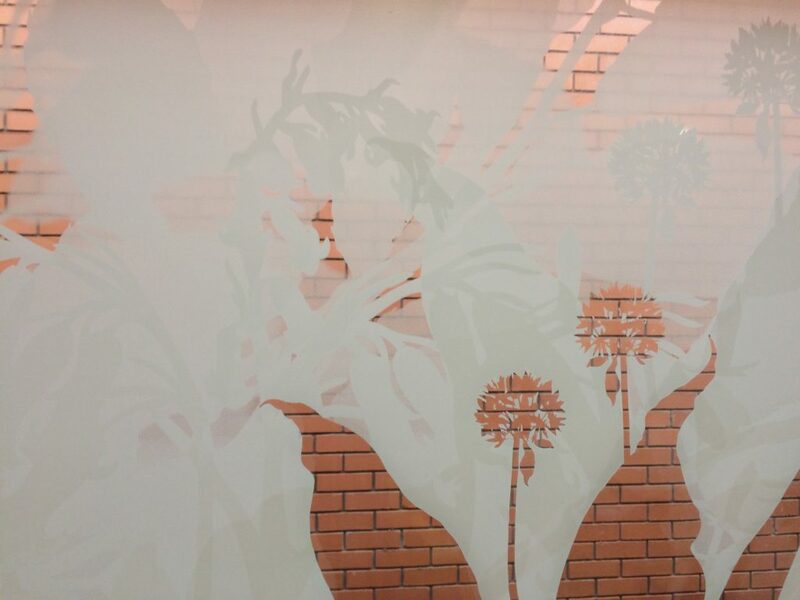 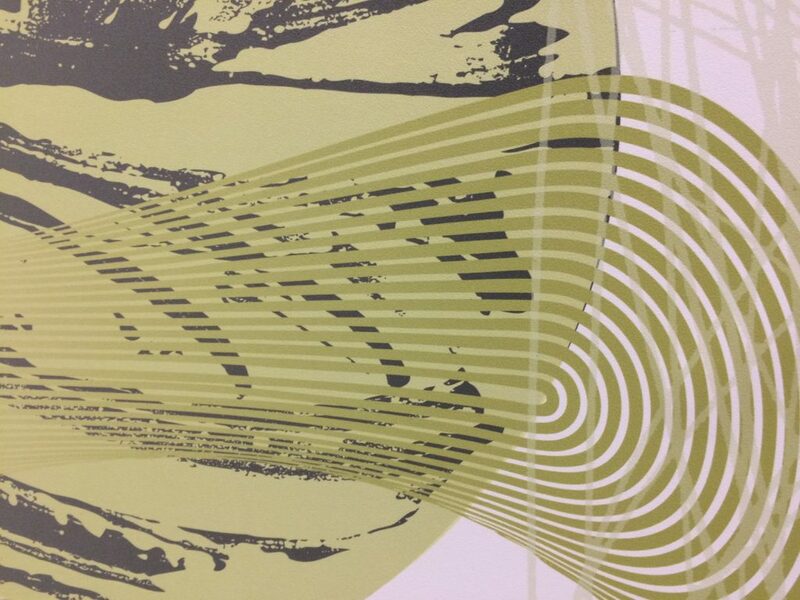 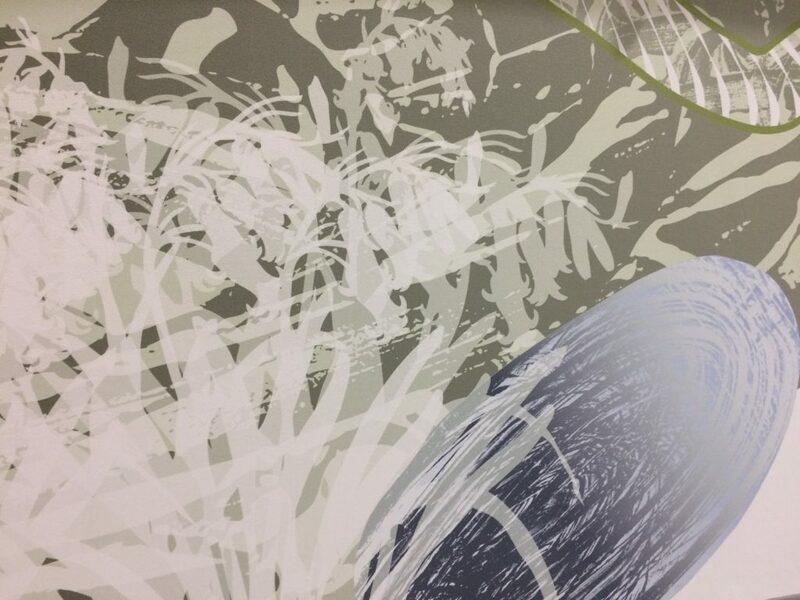 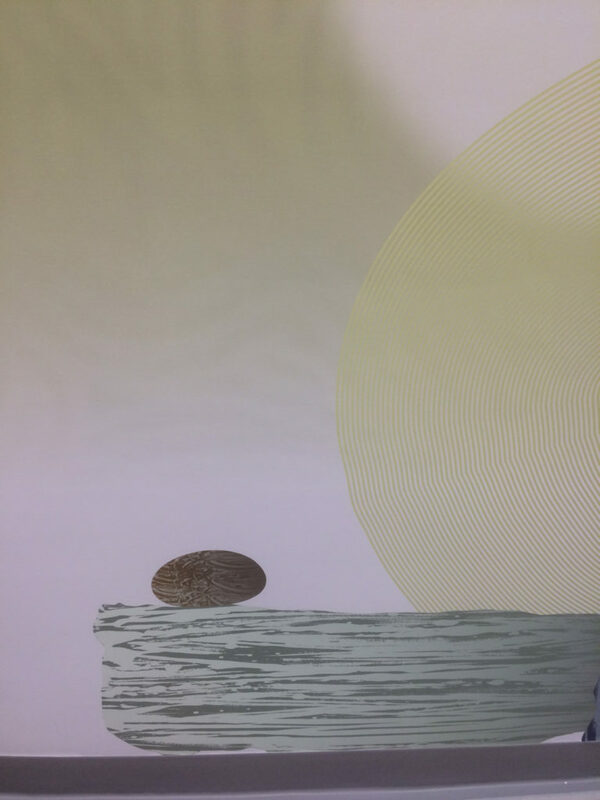 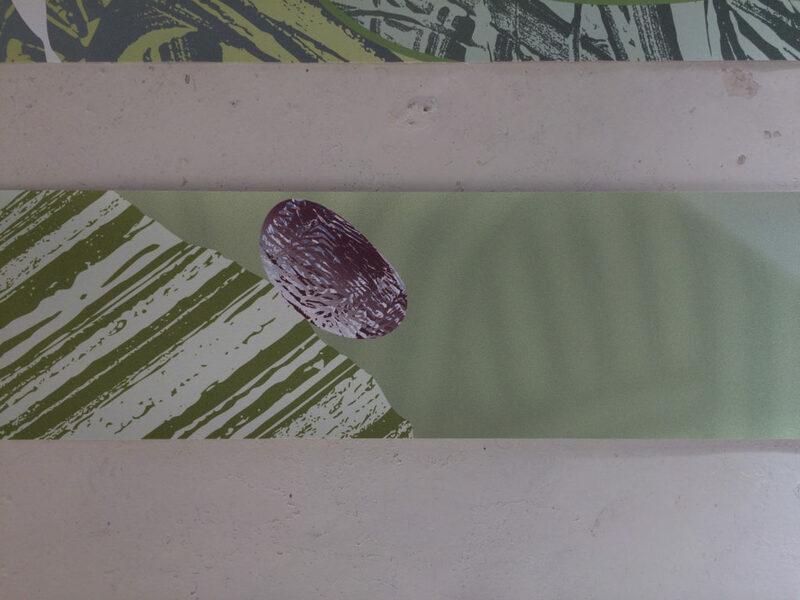 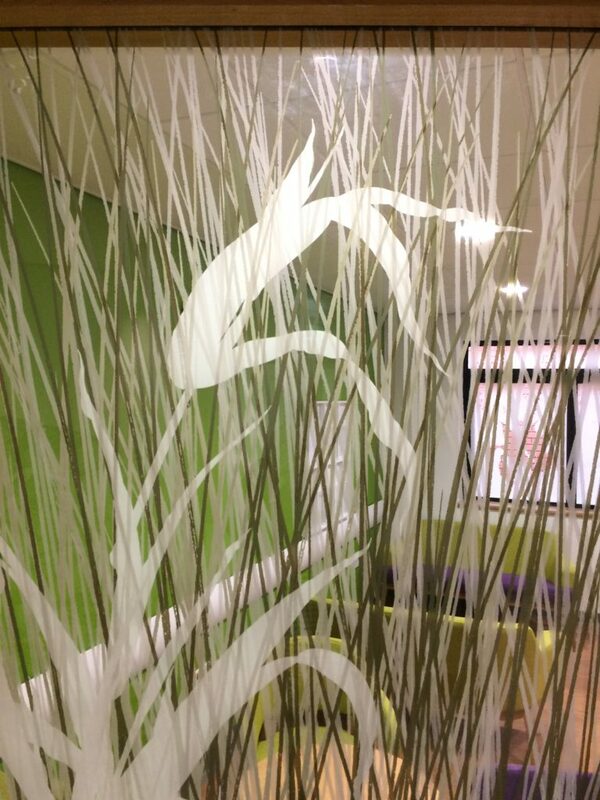 The artwork is digitally printed in tones of opaque and translucent white ink onto optically clear vinyl. 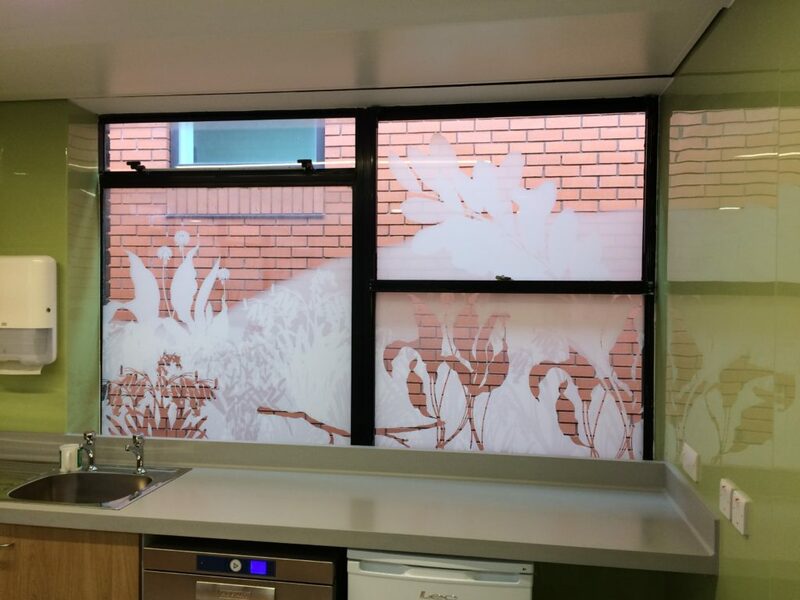 Cut out detailing and clear unprinted areas bring the brick all, colour and texture to work with the design and integrate what could otherwise have been an unforgiving backdrop and view to those working and visiting the spaces. 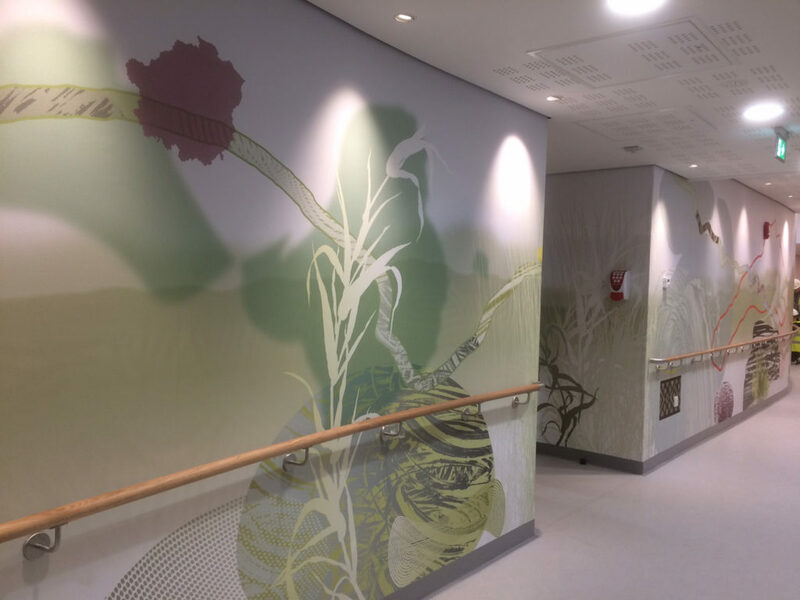 We have collaborated with Vinyl Graphics Ltd – VGL – for this element of the project. 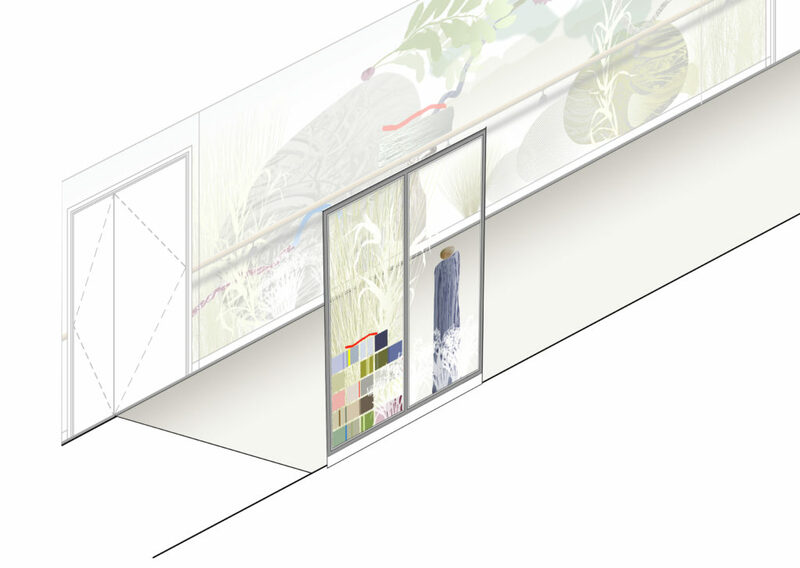 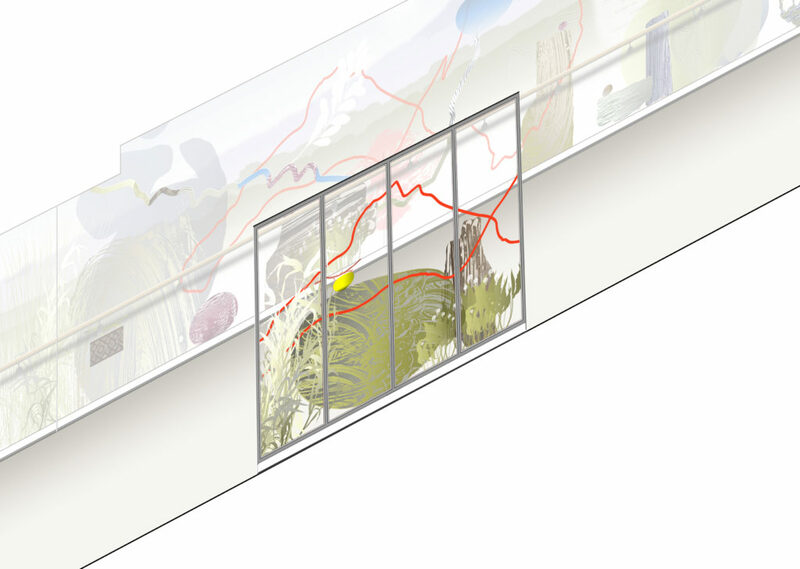 The artwork proposals extend to and include a series of glazed partition screens situated along one side of the main corridor, opposite the large-scale bespoke wallcovering, which itself acts as a grand backdrop to the new unit. 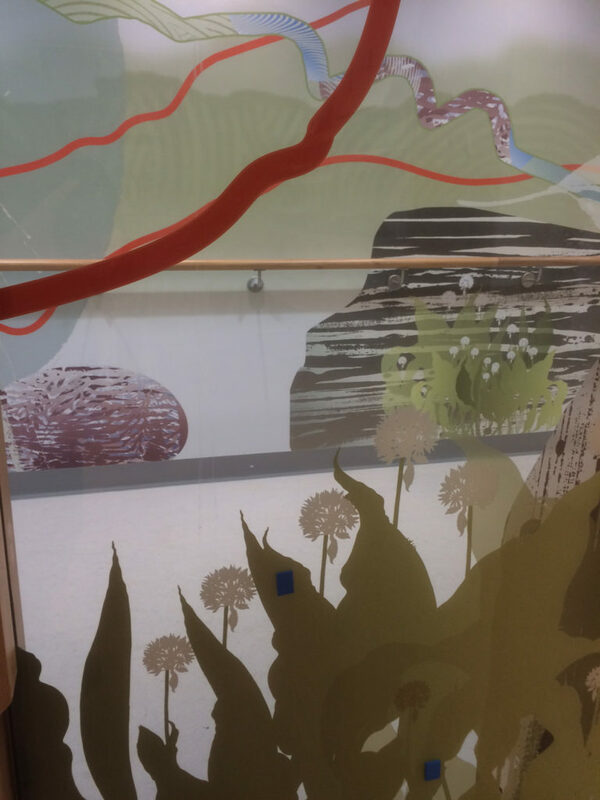 The screens however, can be viewed from both sides, extending the reach of the artwork, which becomes something of a ‘theatre in the round’, presenting multiple viewing points and visual ‘conversations’ & interplay, not only with the artwork, but with the wider architectural scheme and interiors. 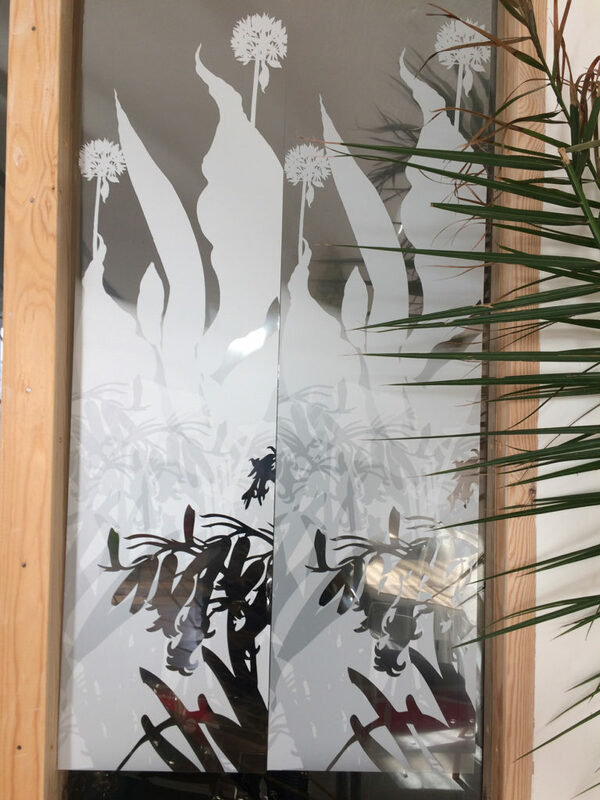 The brief called for these screens to have the artwork encapsulated as a printed laminate between layers of safety glass. 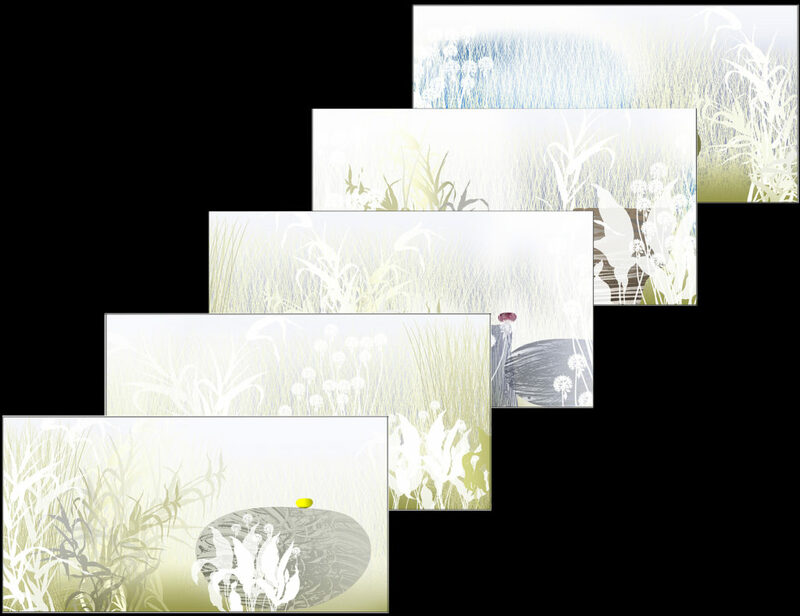 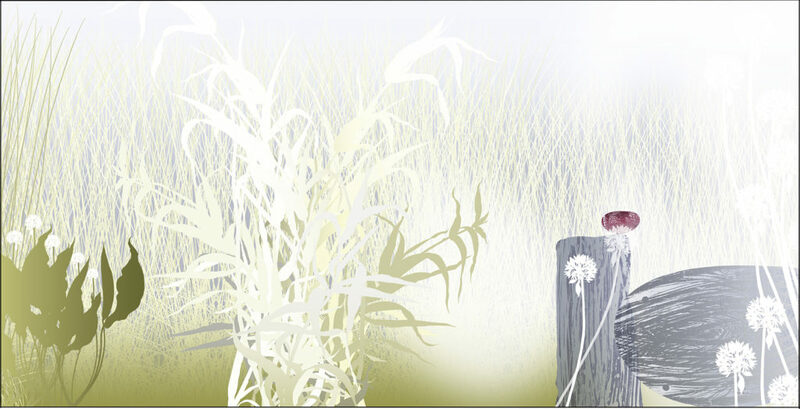 I collaborated with both VGL and The Printed Film Company on this element of the work. 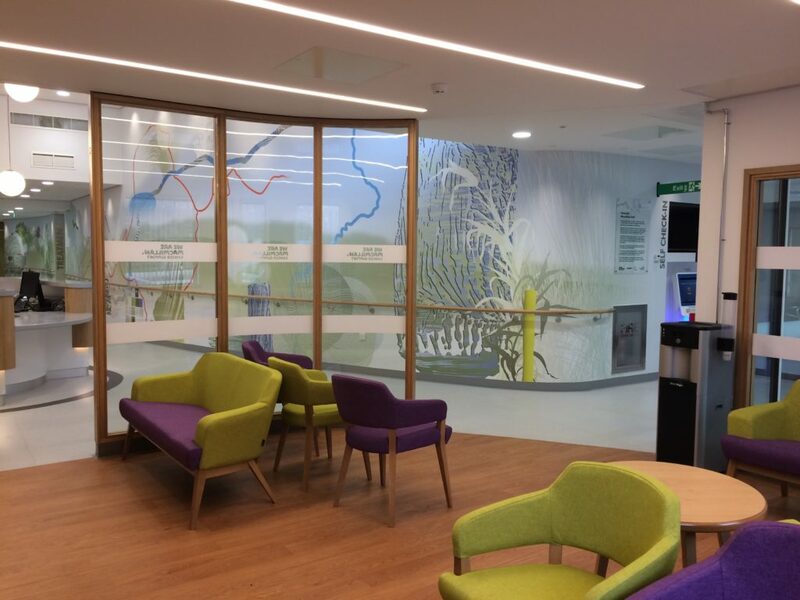 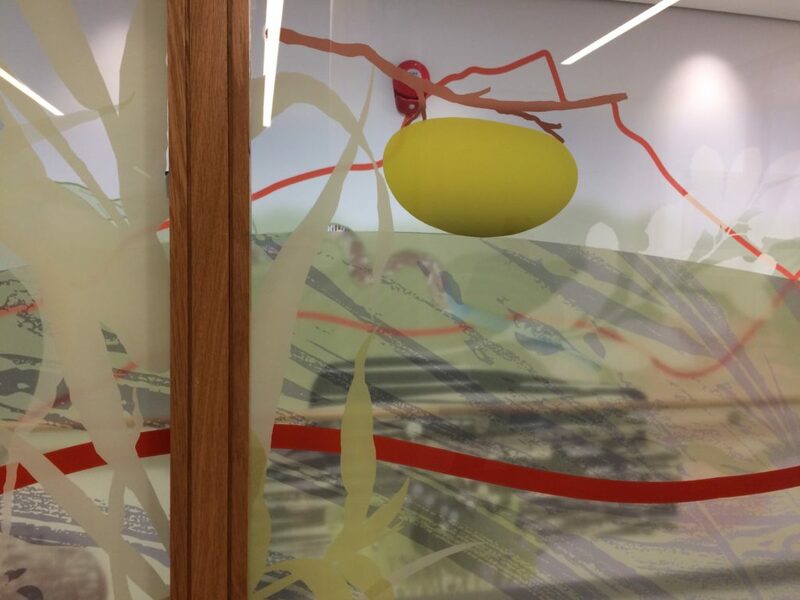 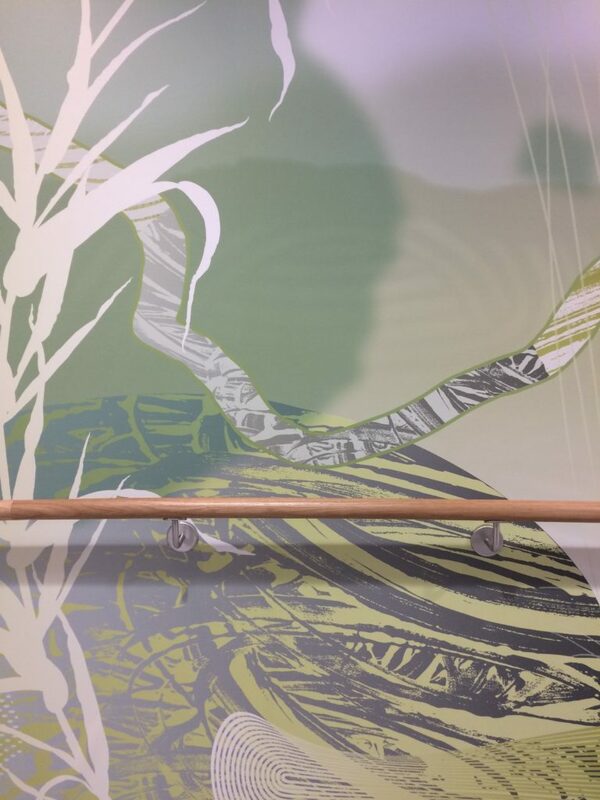 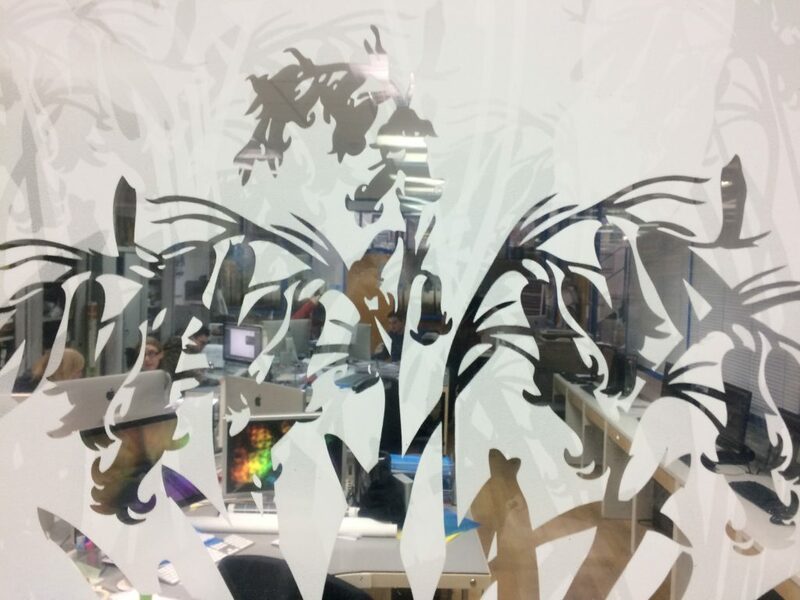 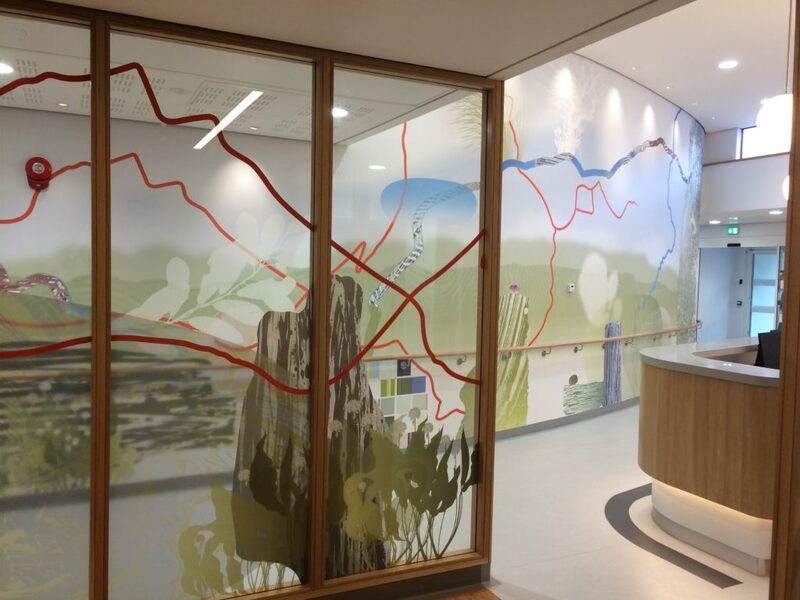 “We were asked to supply decorative laminated safety glass partitions in the main corridor; 6mm + 6mm low iron toughened glass, PVB laminated encapsulating our optically clear PET interlayer, on which we digitally printed the required designs to give pleasing environmental visuals along with manifestation. 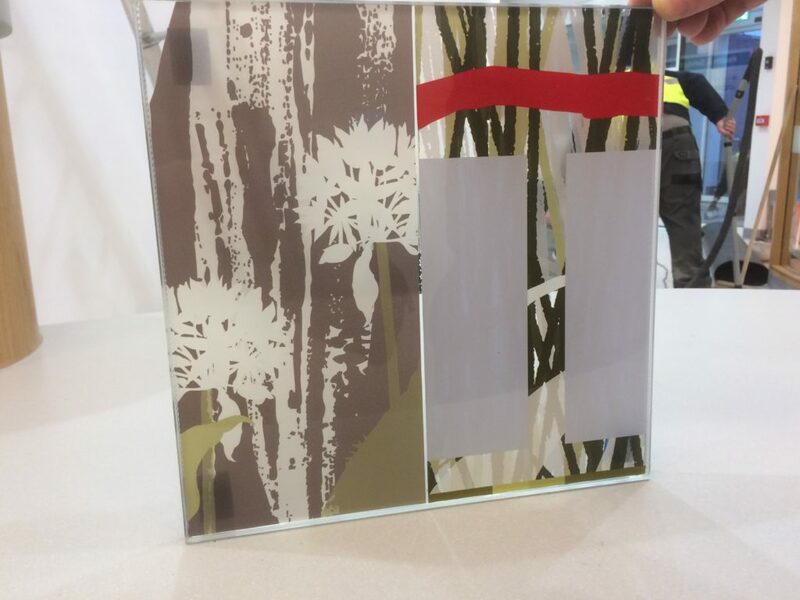 We procured the glass, printed the interlayer’s and managed the lamination process before delivering the laminated panels to site for installation”. 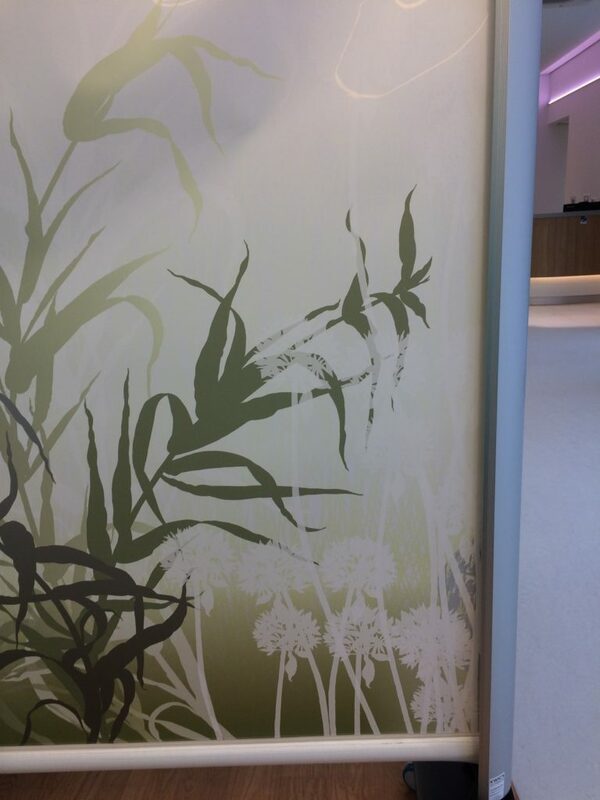 This image also shows the print-white vinyl manifestations applied to the external glazing. 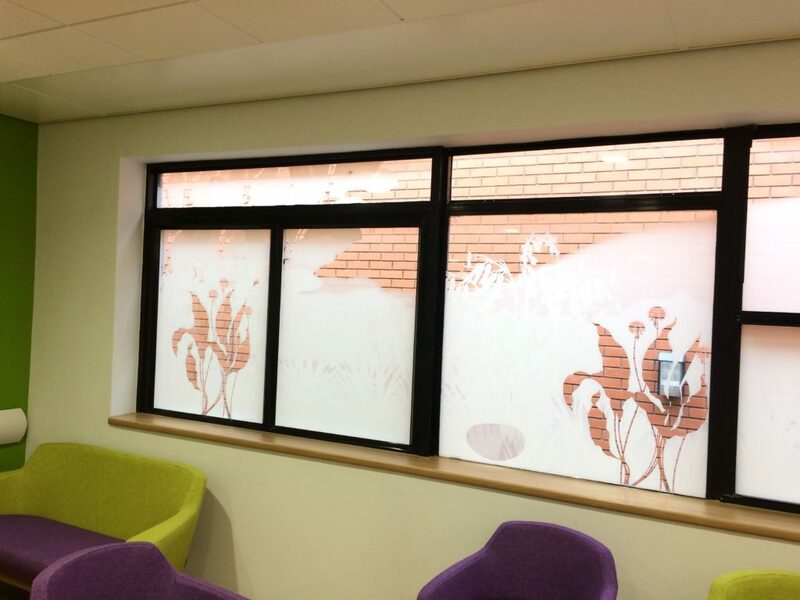 These panels provided a much needed interface between the interior paces and the black brick wall outside. 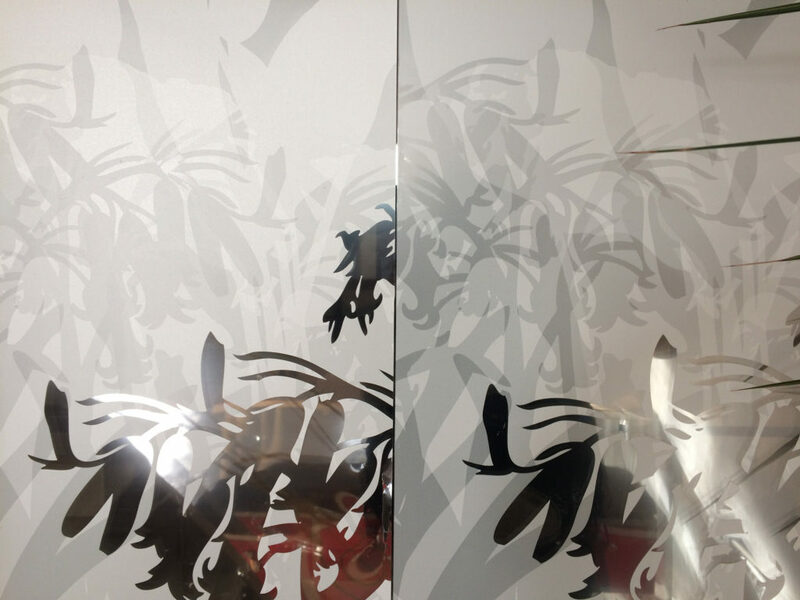 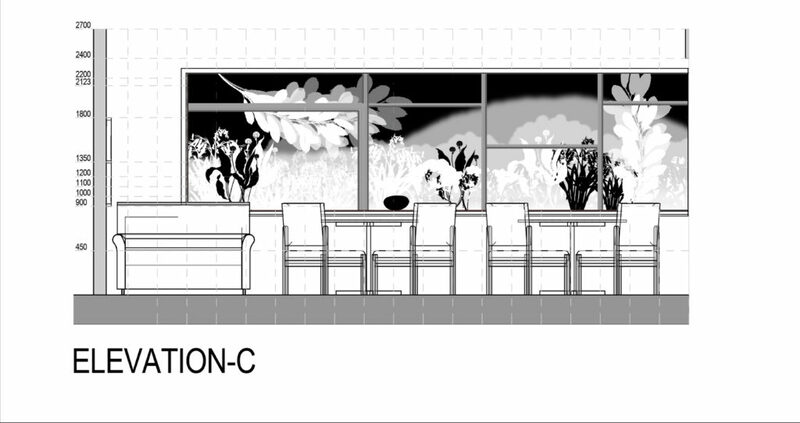 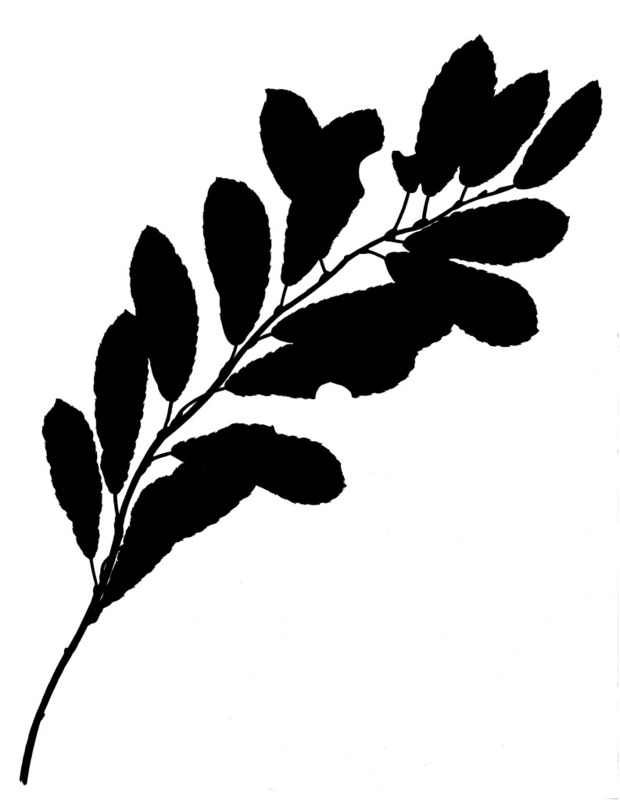 Areas of optically clear glazing, with no artwork are shown here – images above and below – in black. 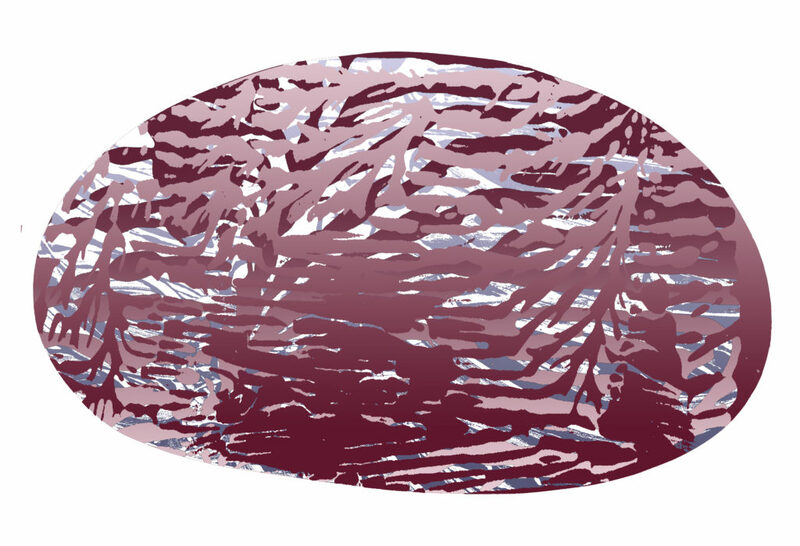 This colour image forms part of the production design detailing and indicates – via darker and lighter magenta tones, the opacity and translucency of a white interlayer, which has colour printed on both sides. 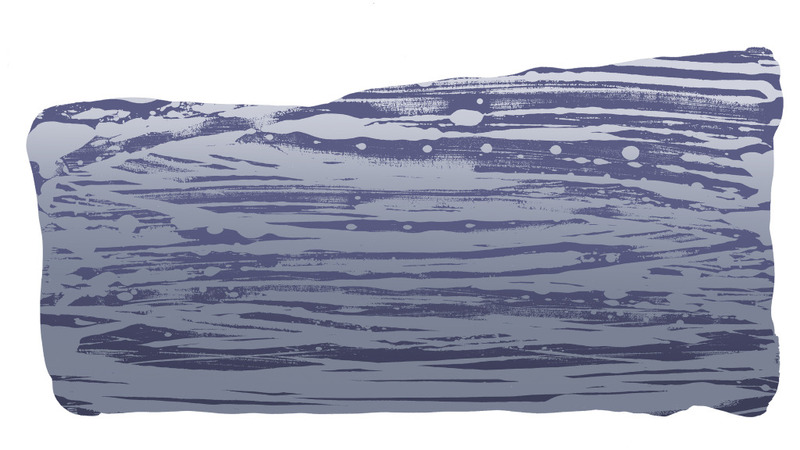 The darker the tone, the more opaque the colour. 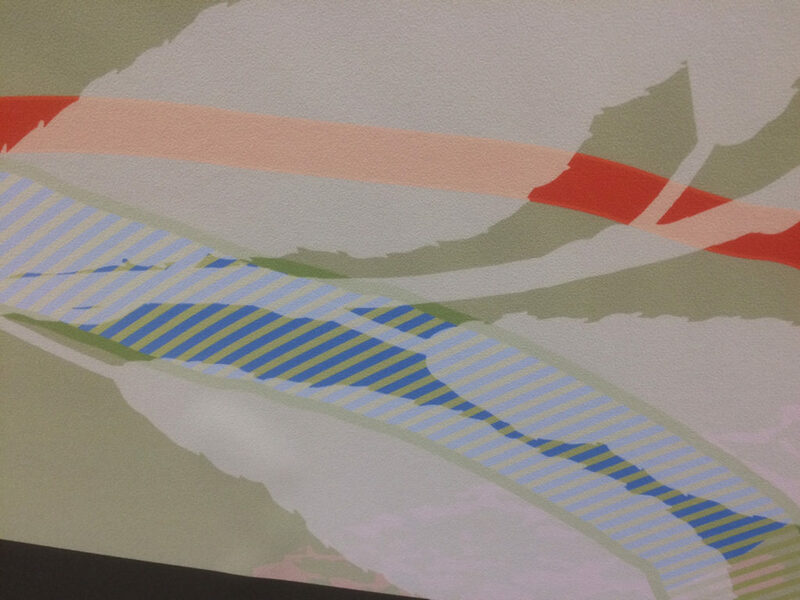 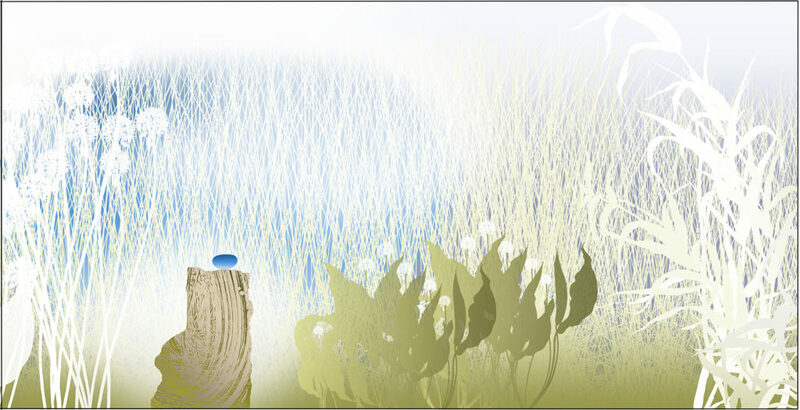 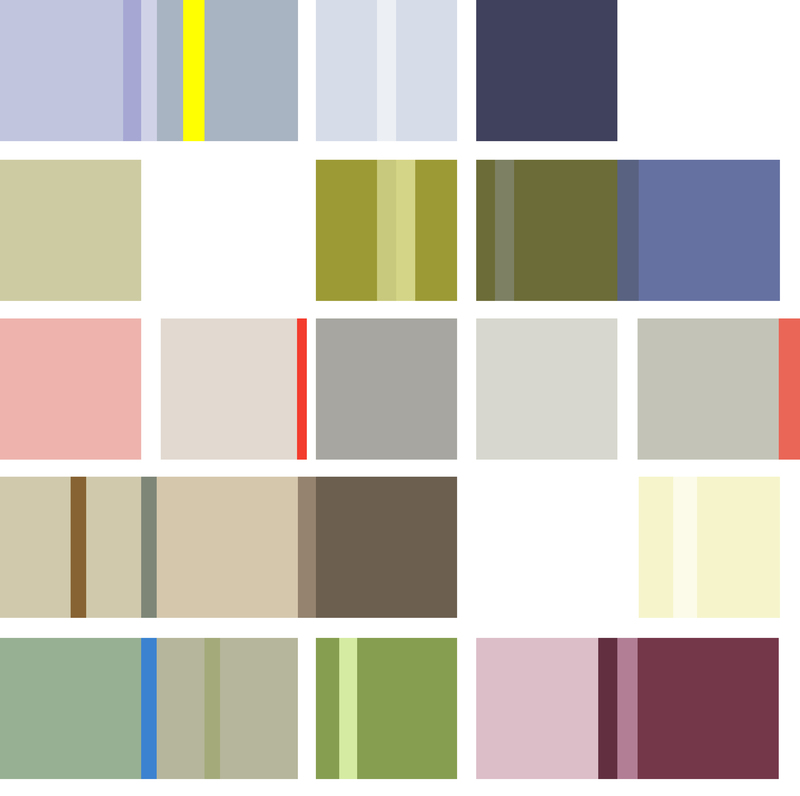 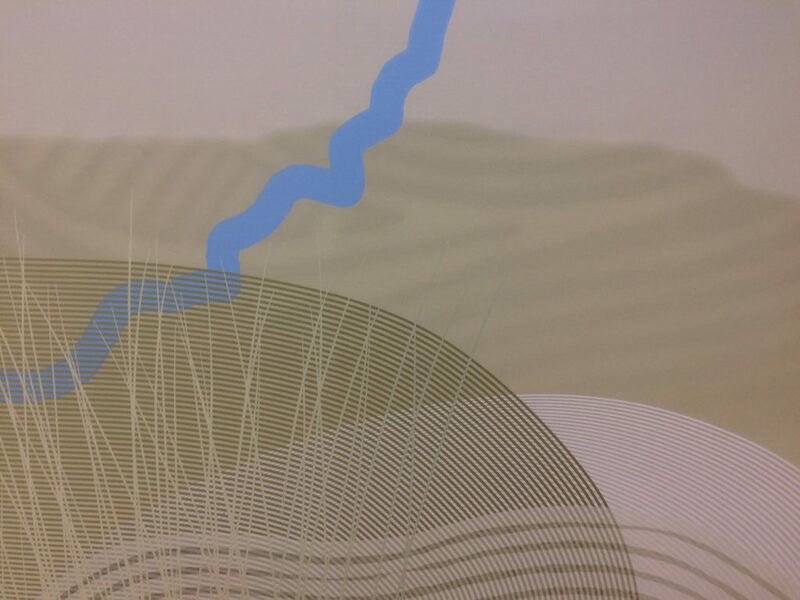 The image above, illustrates the same process described earlier whereby the print-white layer creates the opacity and transparency of the final colour artwork – in this instance the degrees of print-white are indicated in shades of blue. 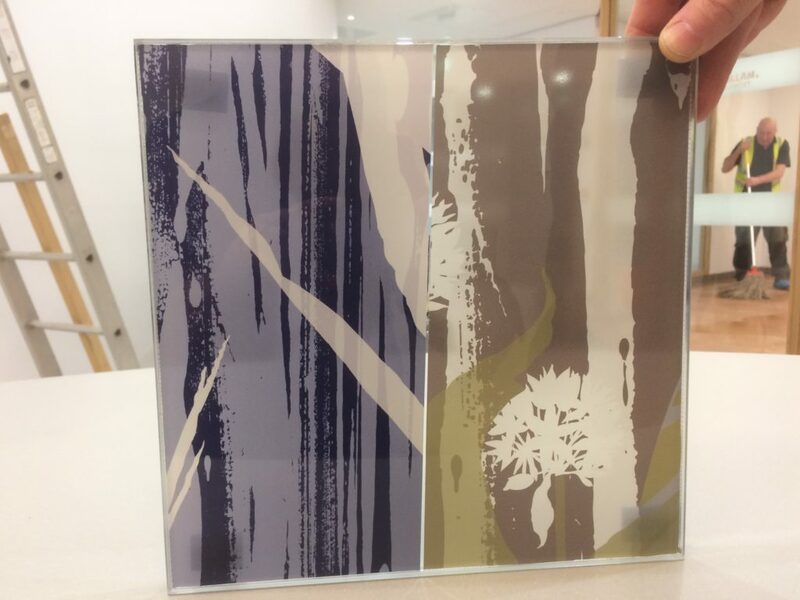 A wide range of samples were produced to achieve the right balance of translucent and opaque colour. 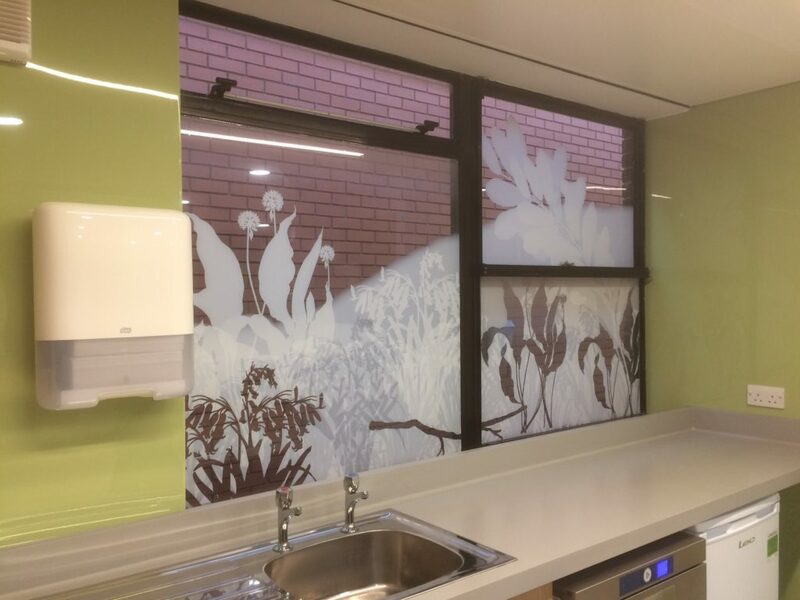 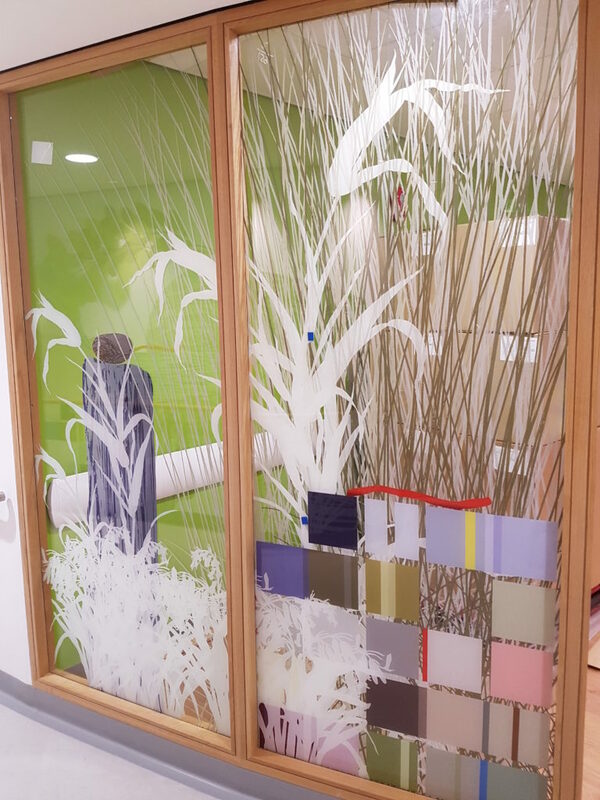 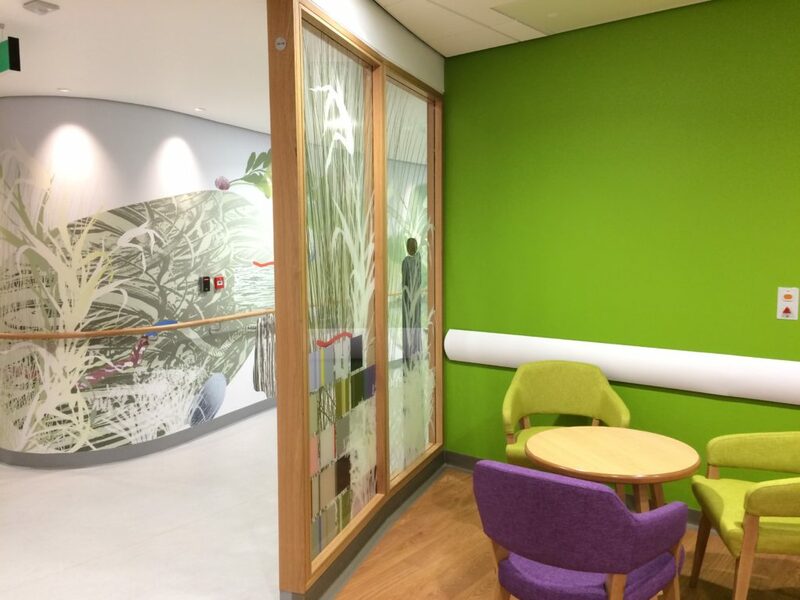 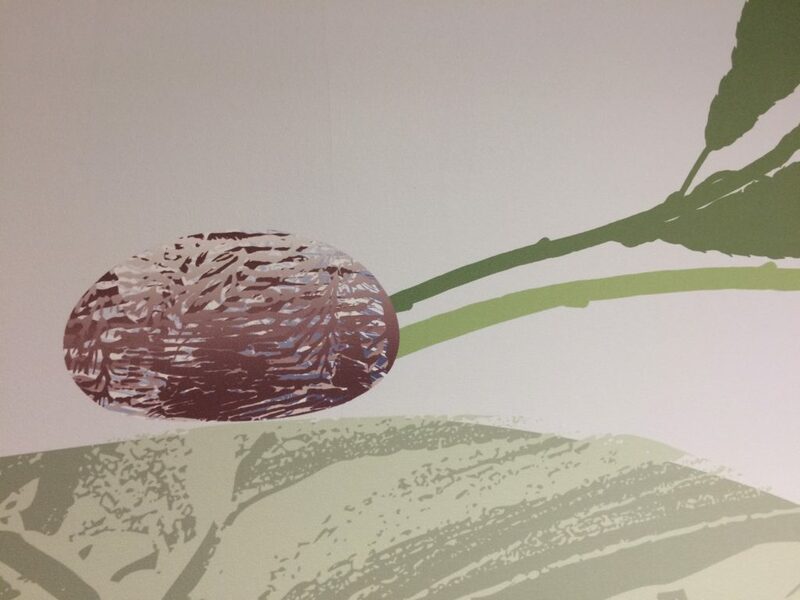 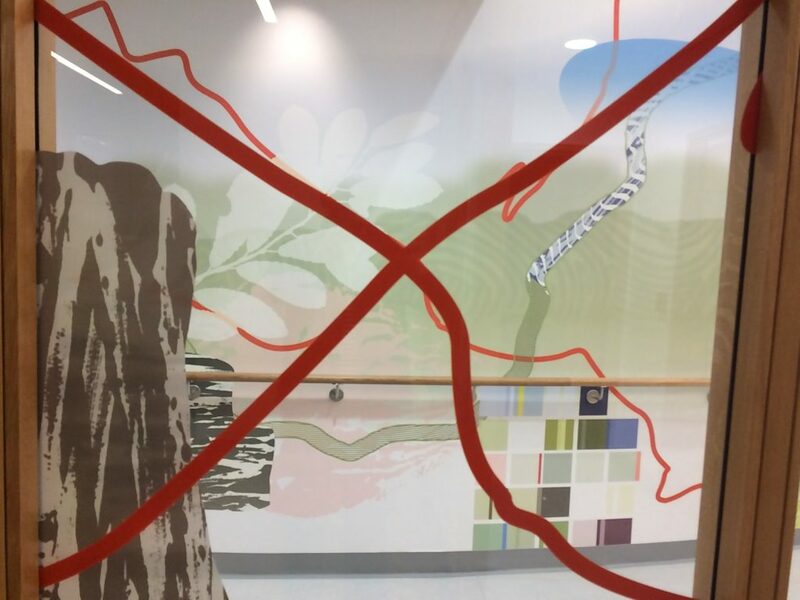 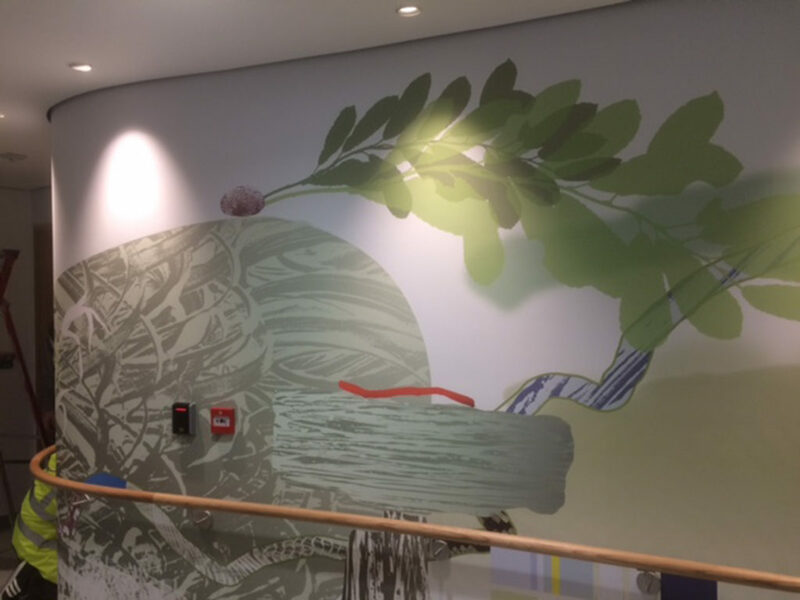 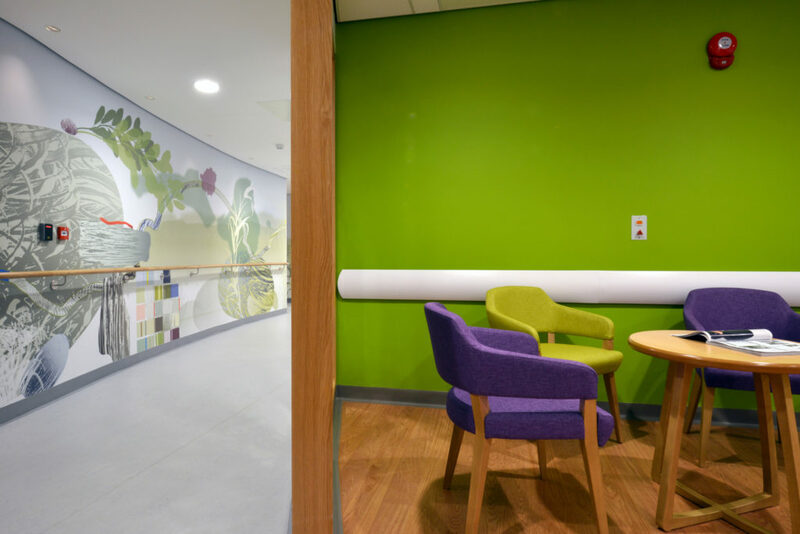 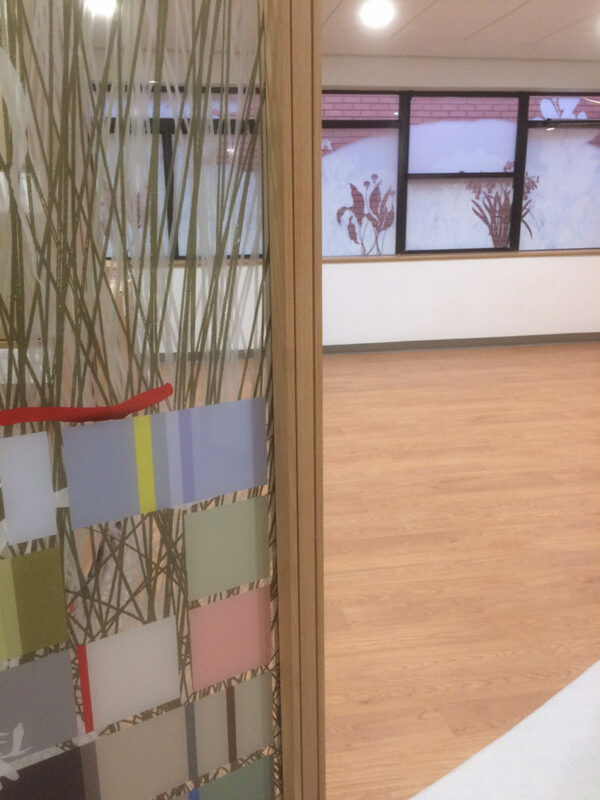 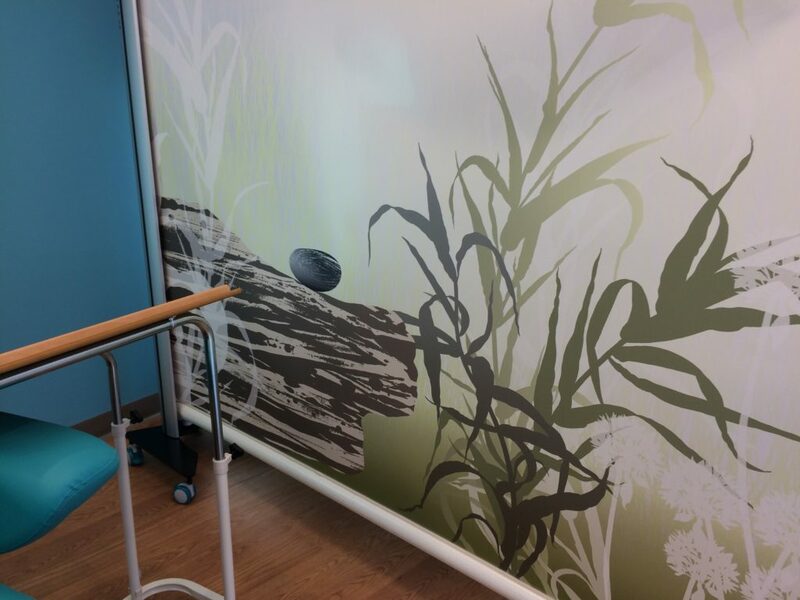 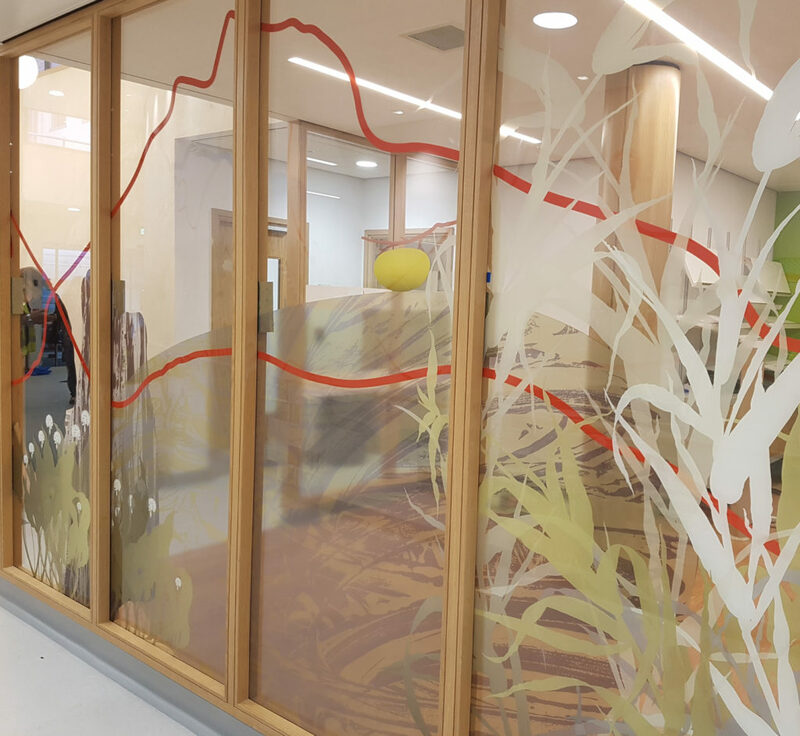 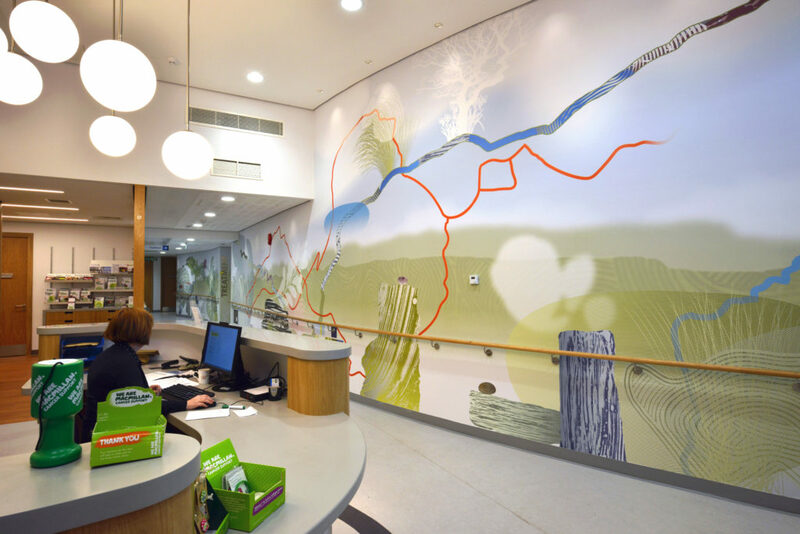 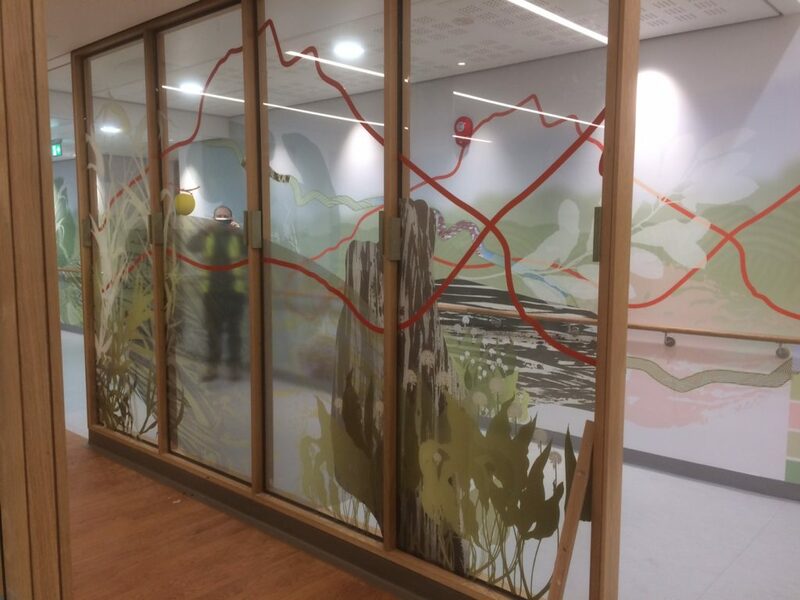 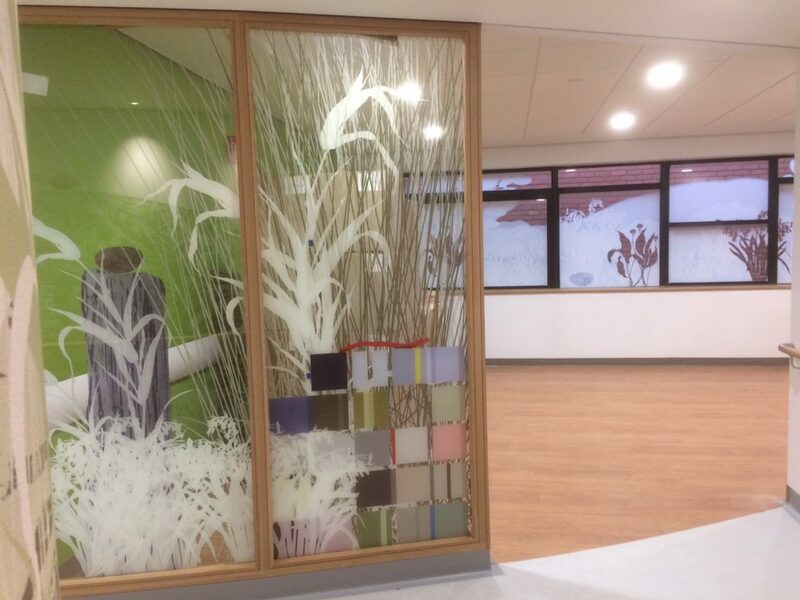 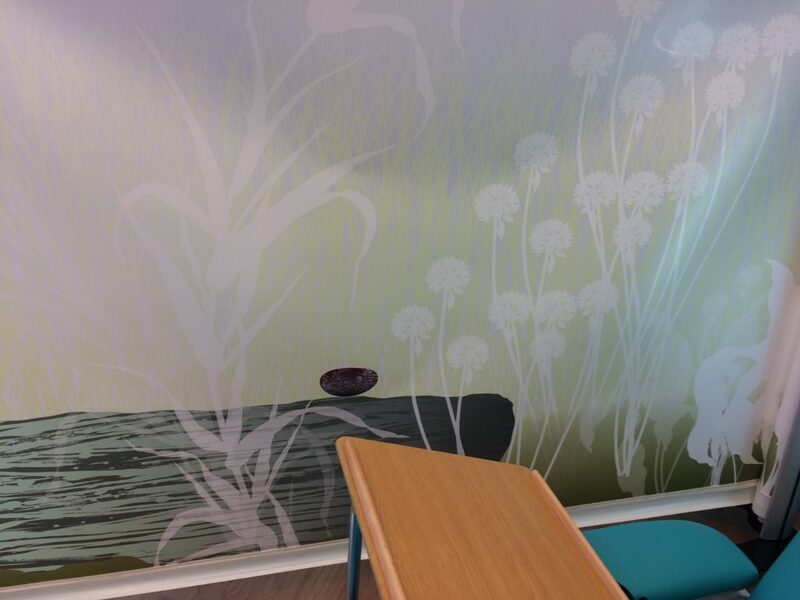 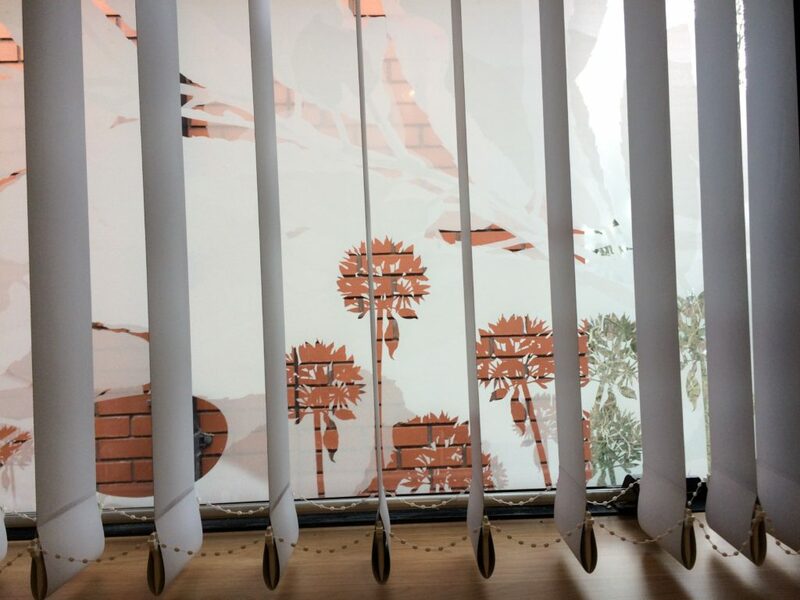 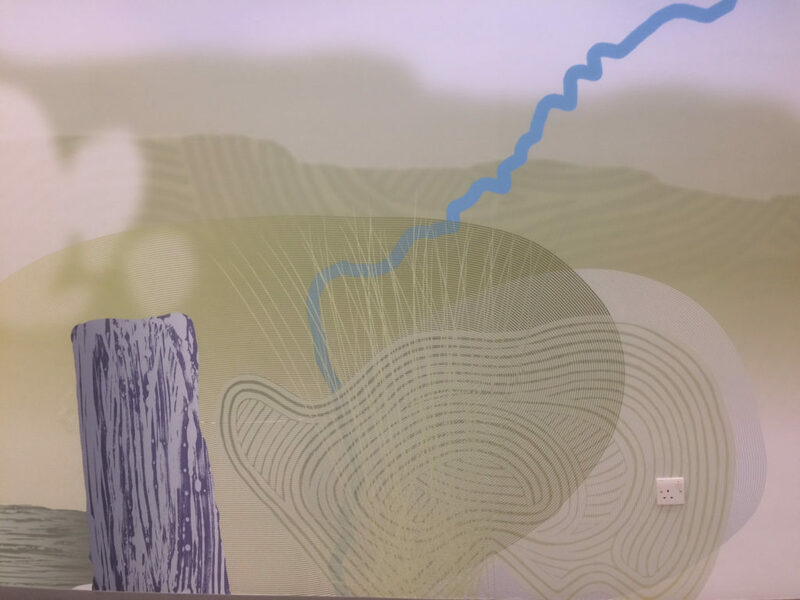 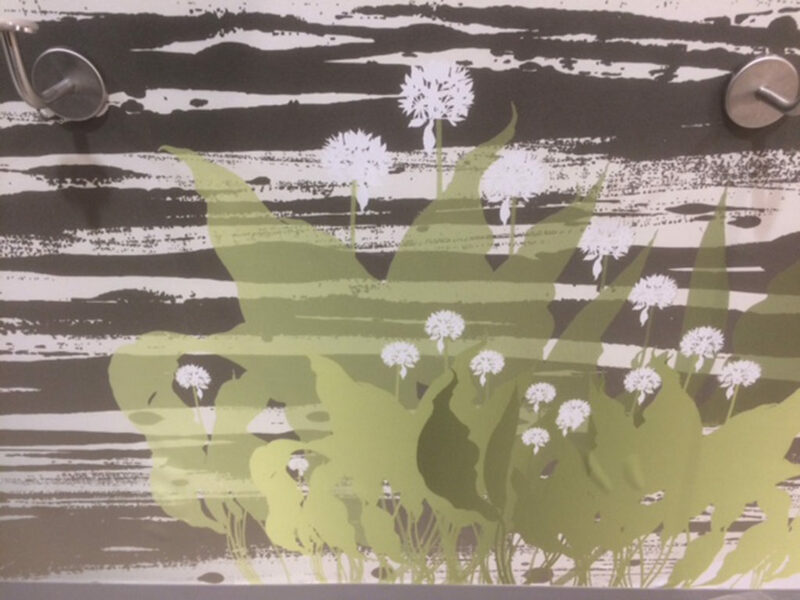 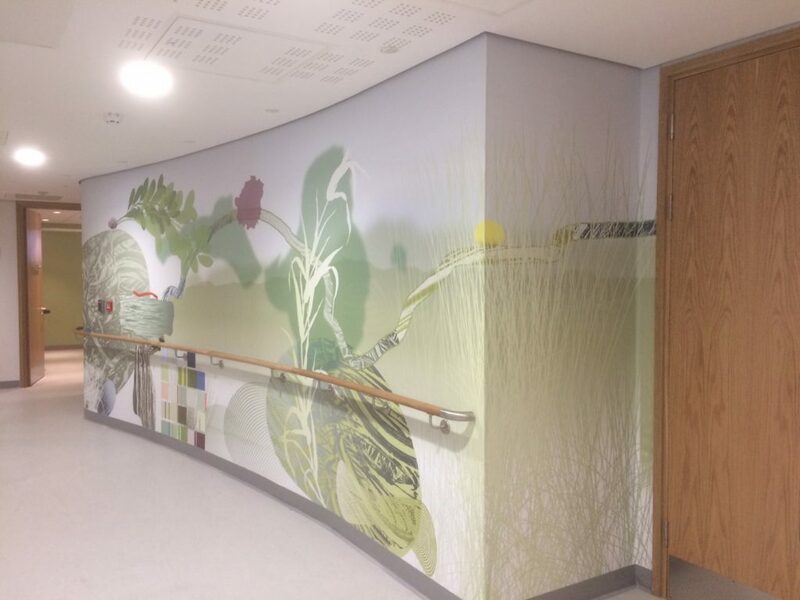 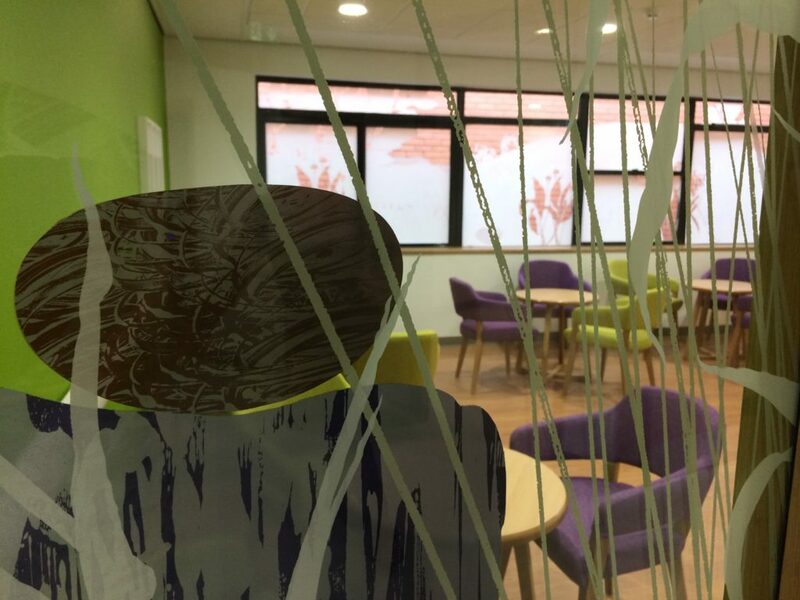 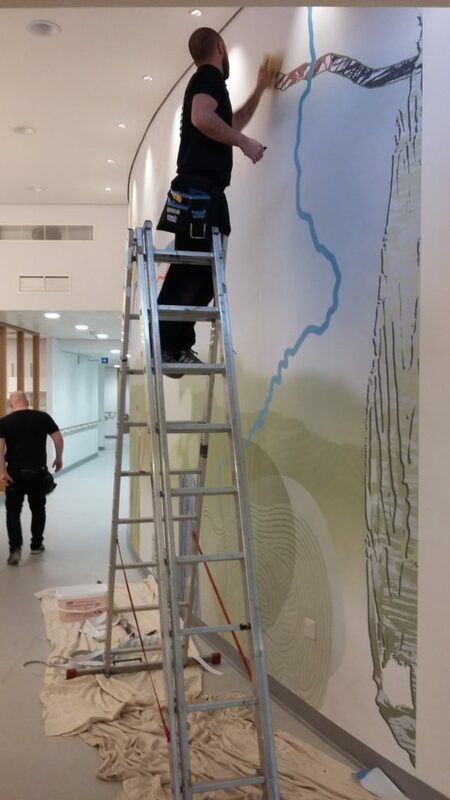 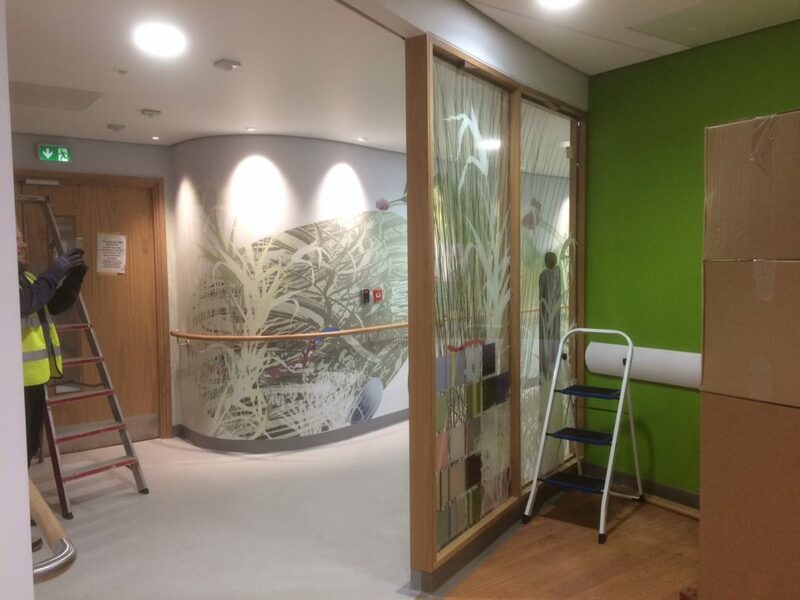 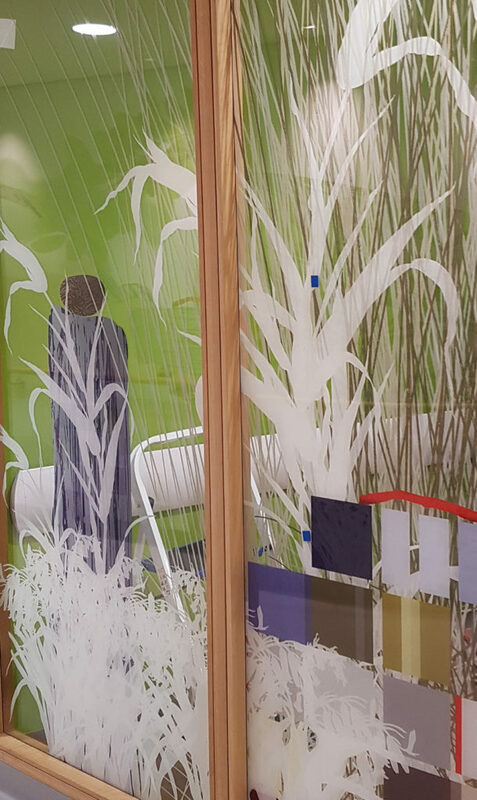 The Chemotherapy Treatment Room within the New Macmillan Unit at Tameside and Glossop Integrated Care NHS Foundation Trust will feature five retractable ‘pull-out’ privacy screens manufactured by Kwickscreen, onto which artwork can be digitally printed. 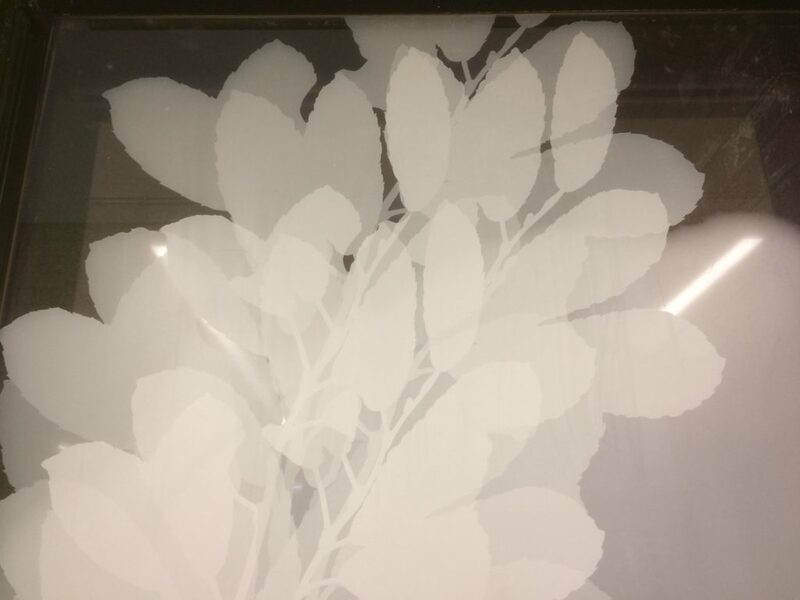 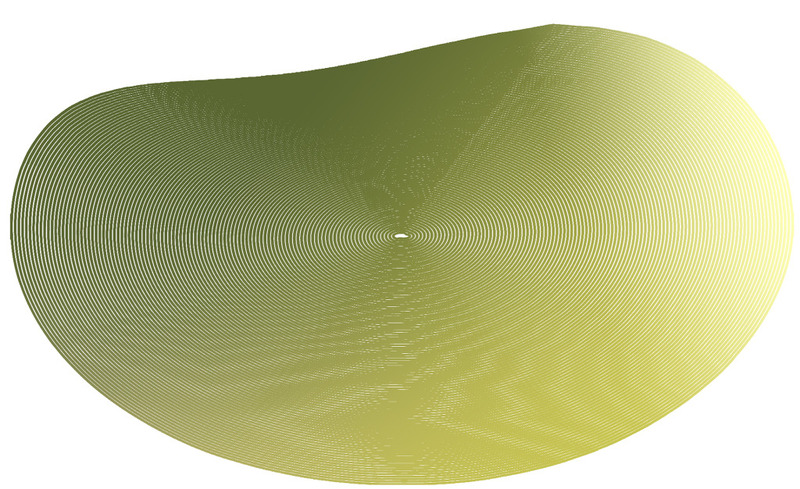 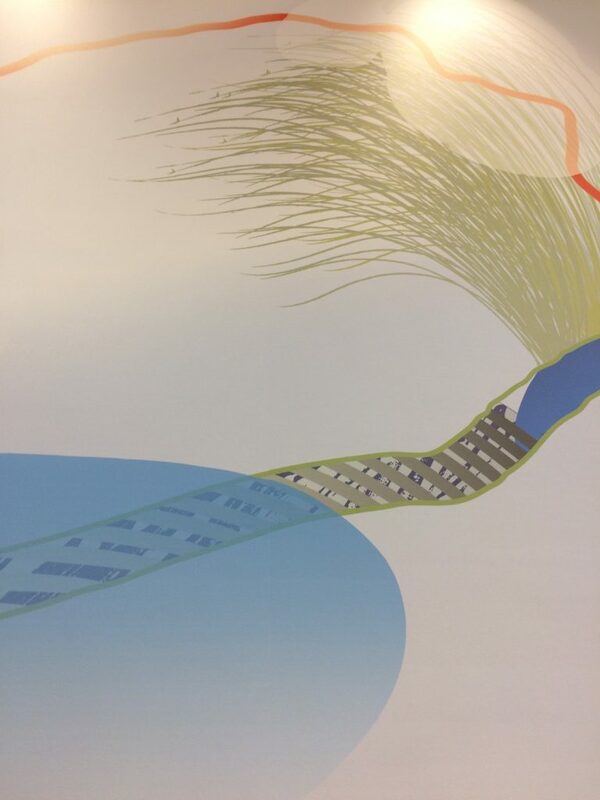 The flexible material for printing is an opaque, but translucent (if that makes sense!) 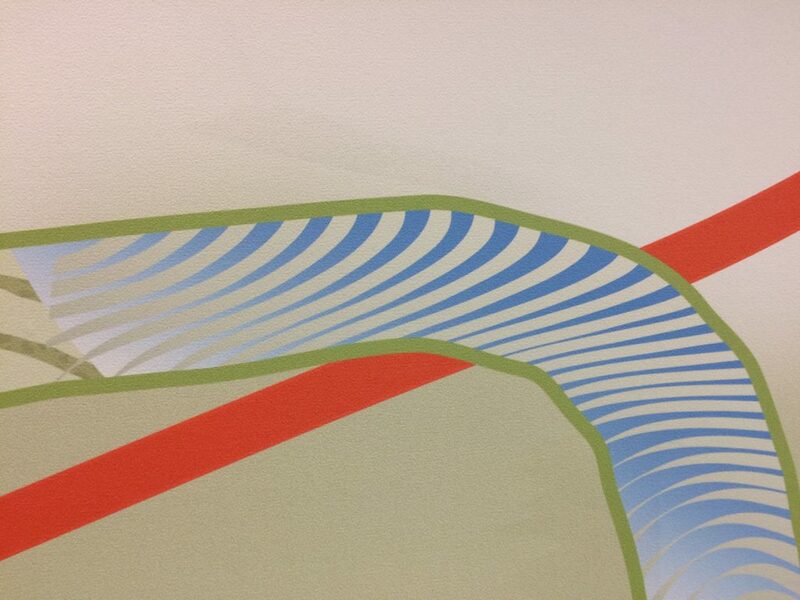 crisp white vinyl. 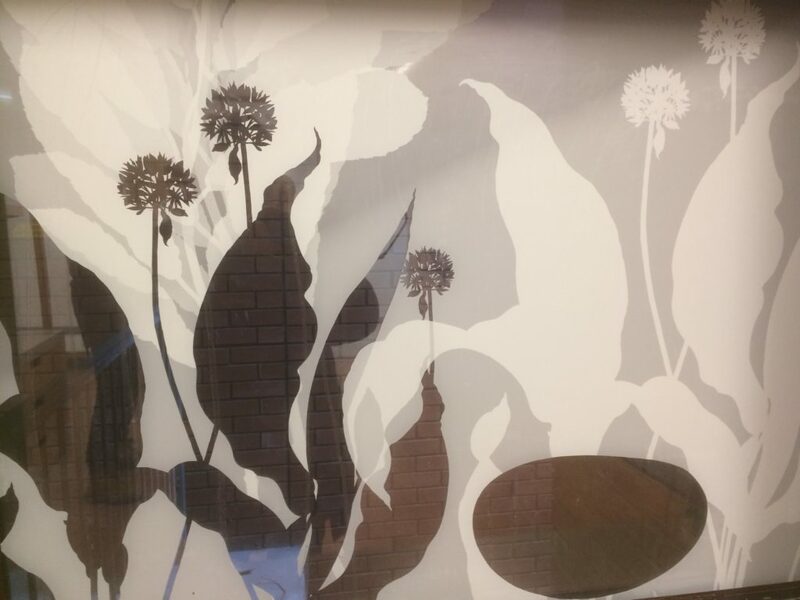 We have proposed a series of artworks inspired by the theme originally drawn out in the main corridor artwork & also by the new planting and design of the adjacent external courtyard designed by Olivia Kirk Gardens. 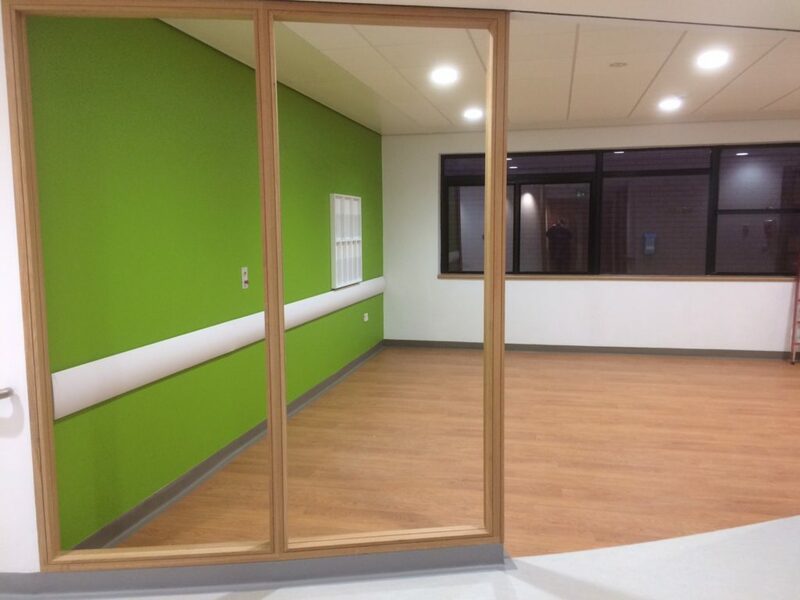 The large windows of the Treatment Room face directly into this newly refurbished and planted space. 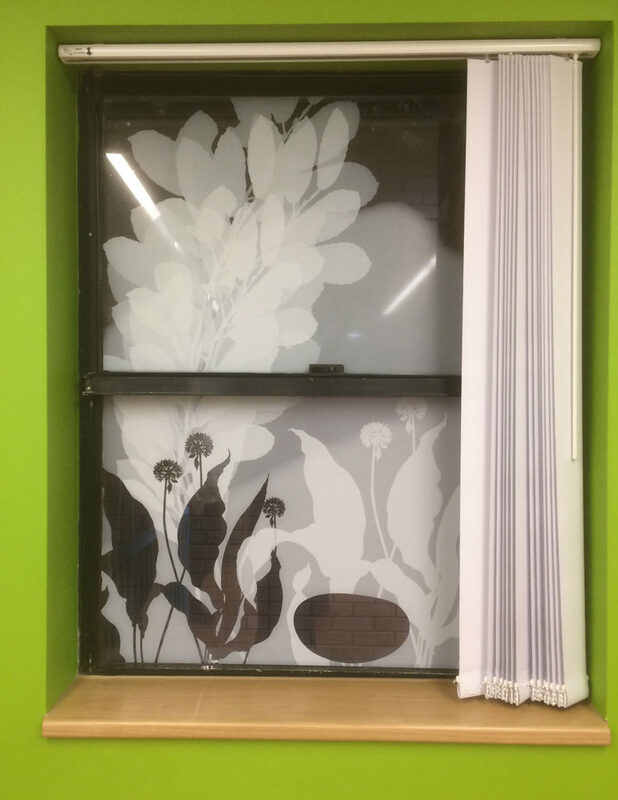 It is unlikely that all the screens will be drawn out at the same time…what is more likely is that smaller sections of each screen may be visible at various times, creating an ever changing backdrop to the activity in the room. 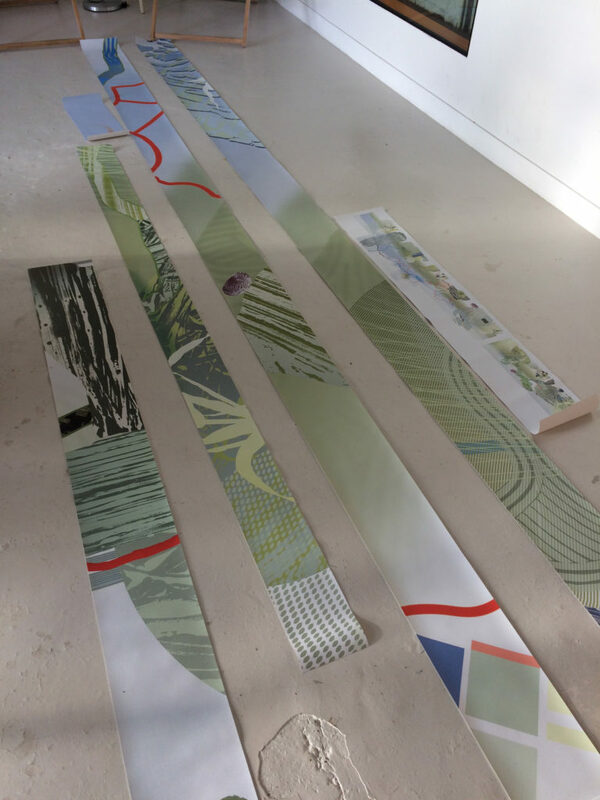 We decided to keep the development and manufacture of the detailed site-specific artwork for the unit under wraps to allow for further consultation, production development and sampling etc. 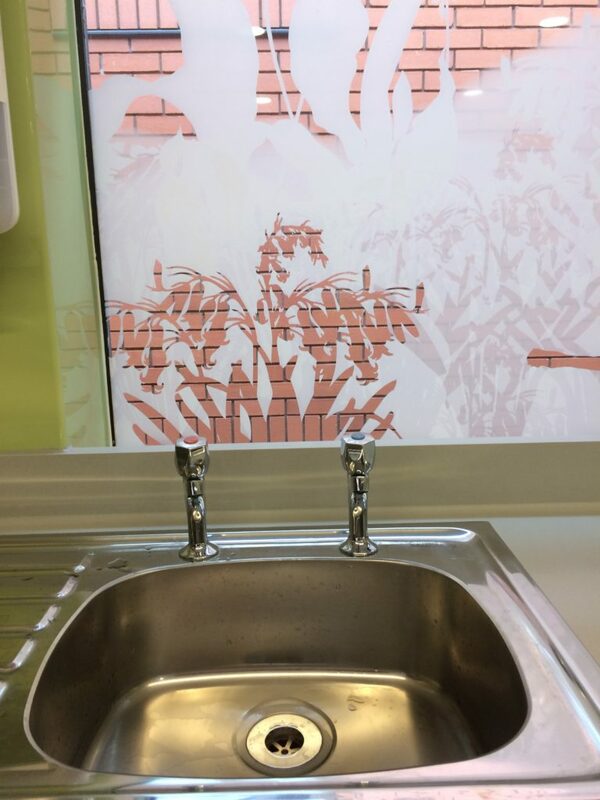 Since the last post 8 months ago now, things have really moved on! 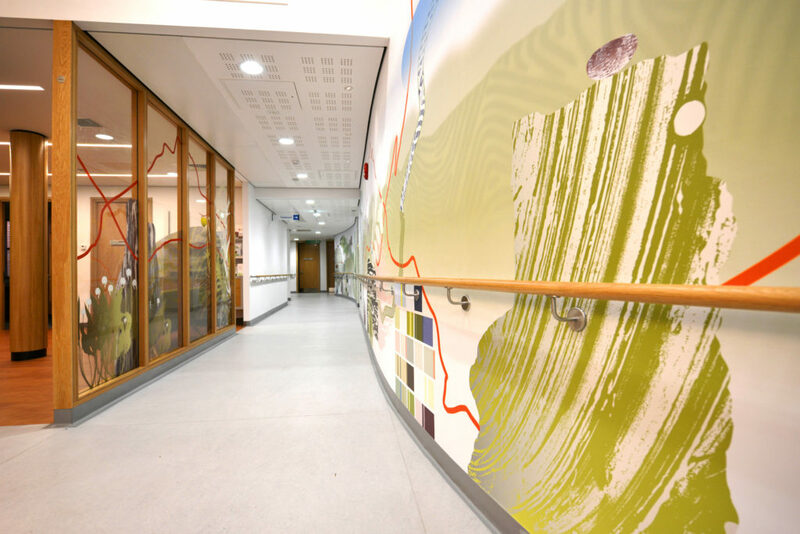 Following design approvals and sign-off at the end of April 2016, we embarked on the detailed design work for production with VGL and other specialist contractors and suppliers. 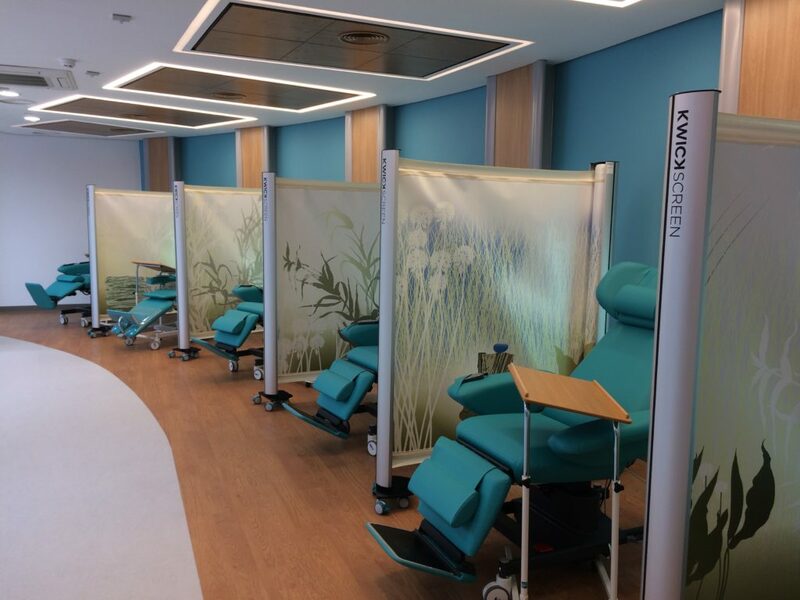 Retractable Privacy Screens for the Chemotherapy Treatment Room, being manufactured and supplied by Kwickscreen. 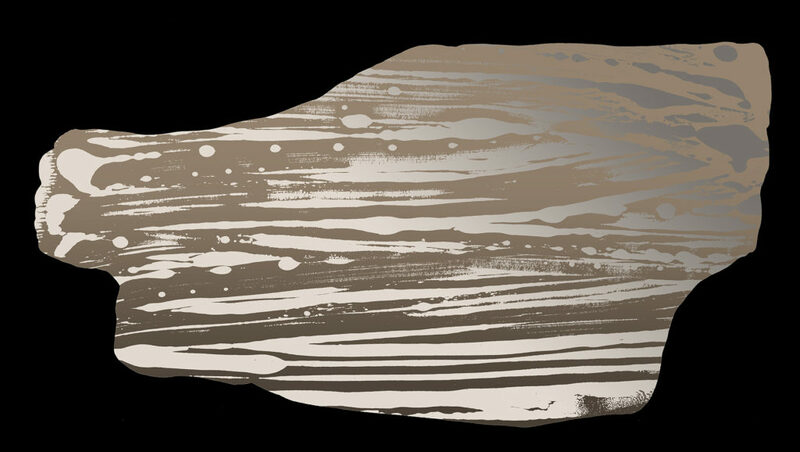 One that got away ! 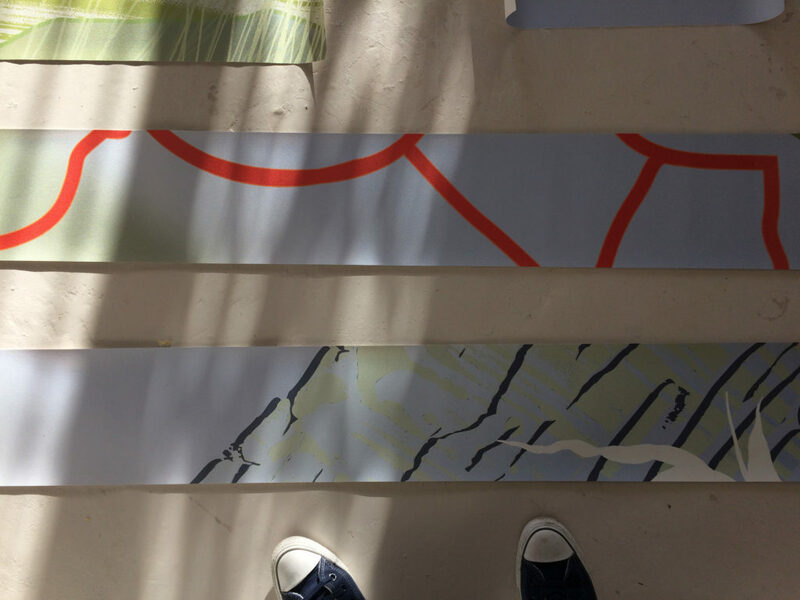 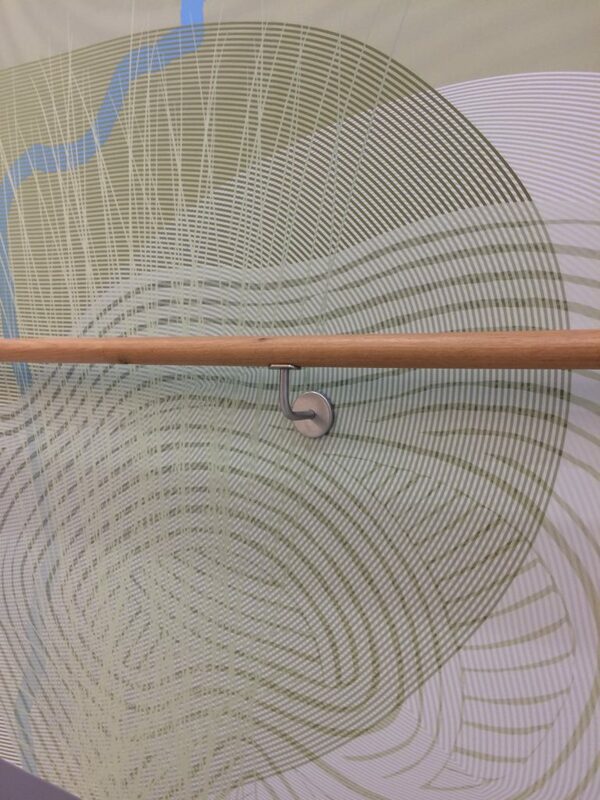 …Early drafts for undeveloped SuperGraphic signage / railing detail. 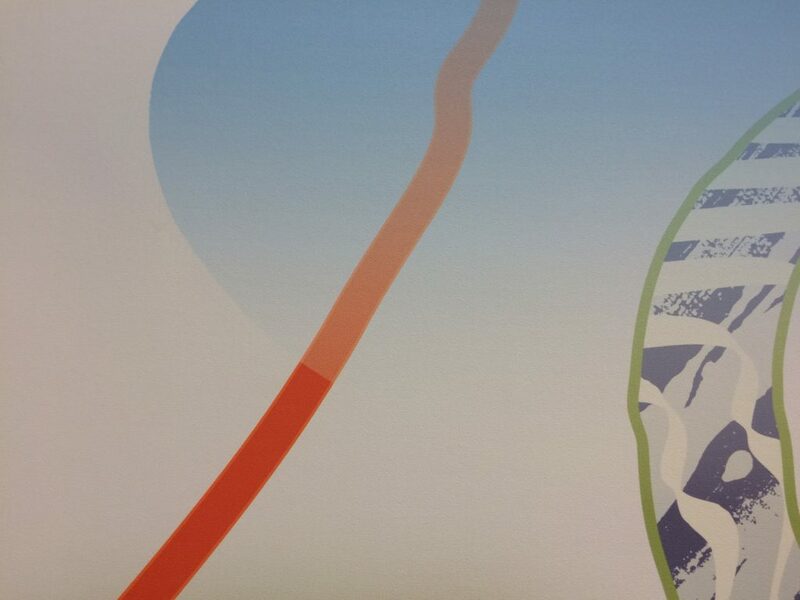 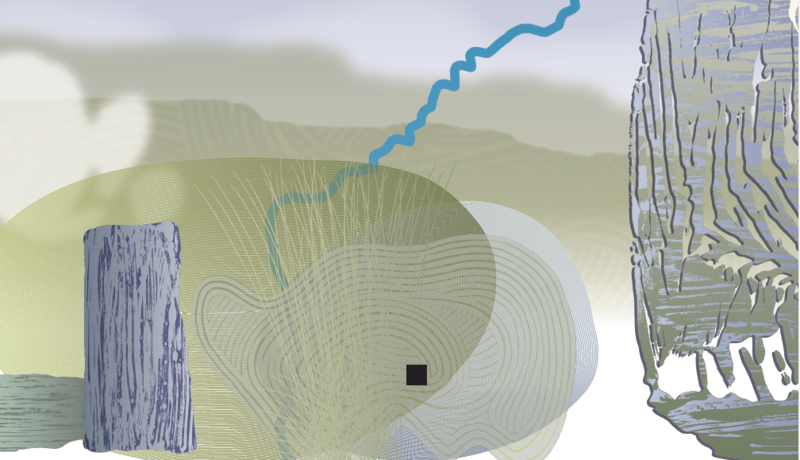 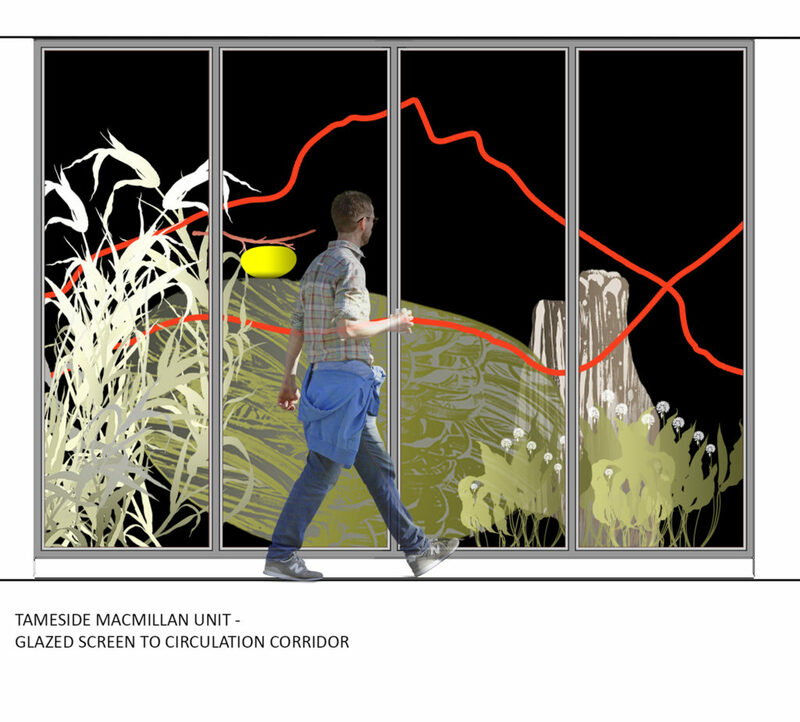 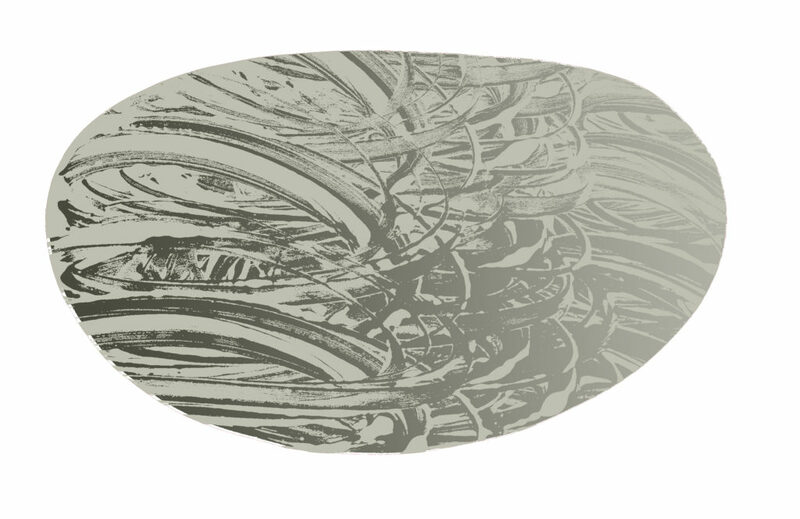 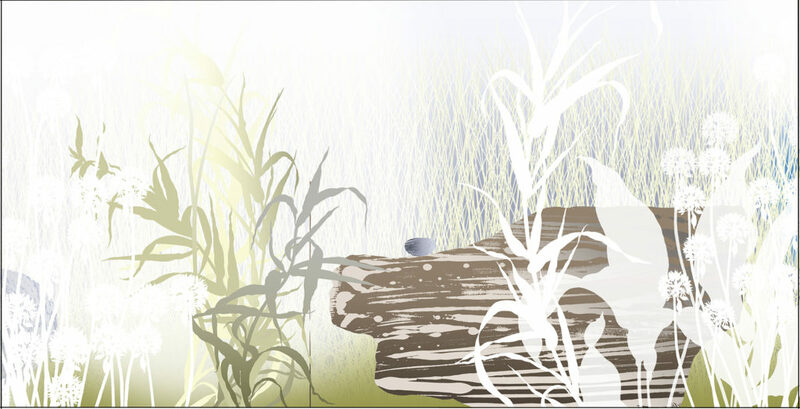 Draft for SuperGraphic signage / railing for the Macmillan Unit entrance by Christopher Tipping. 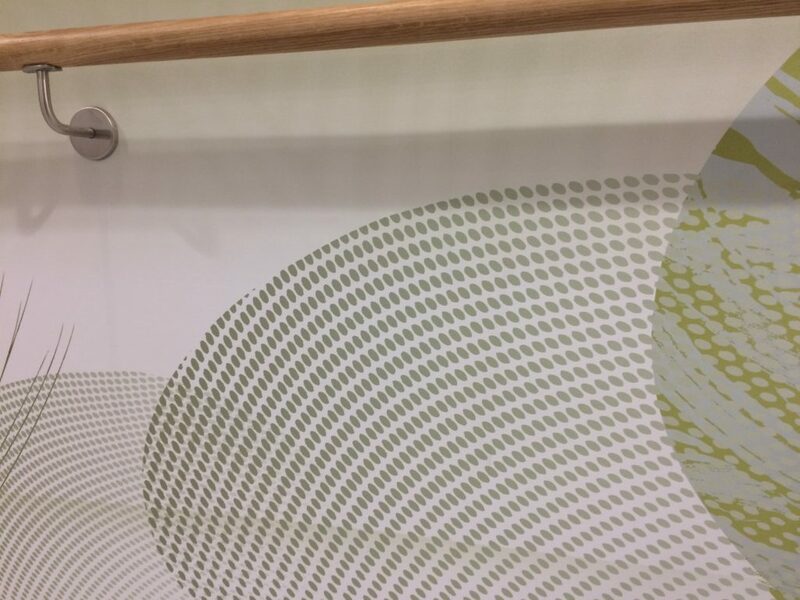 Michael Hughes of IBI Group – our Project Architect, has however designed a brilliant new canopy entrance feature – not sure I can show that one just yet ! 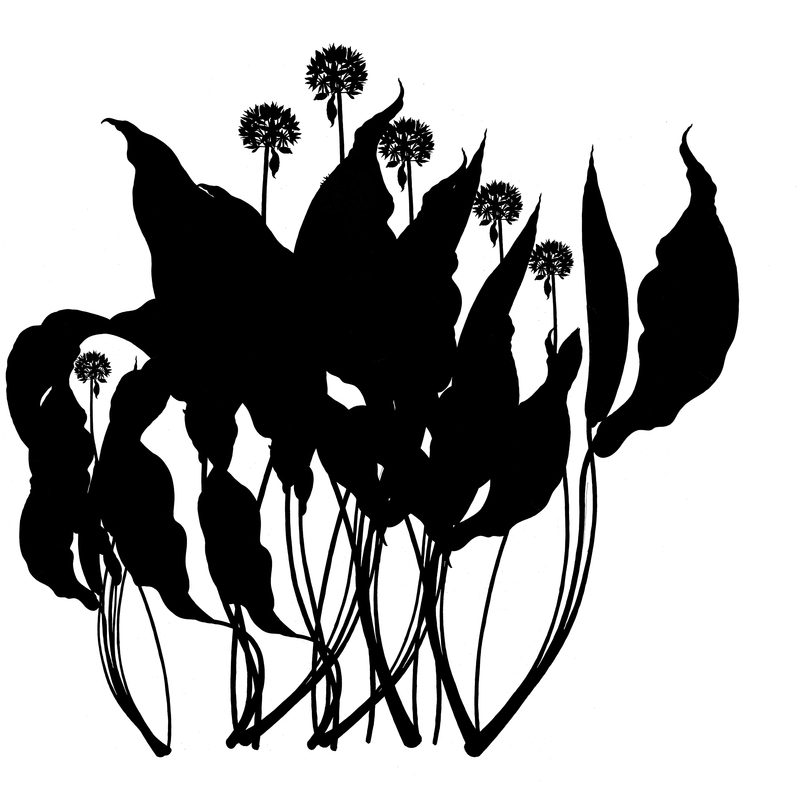 – but will get an image asap ! 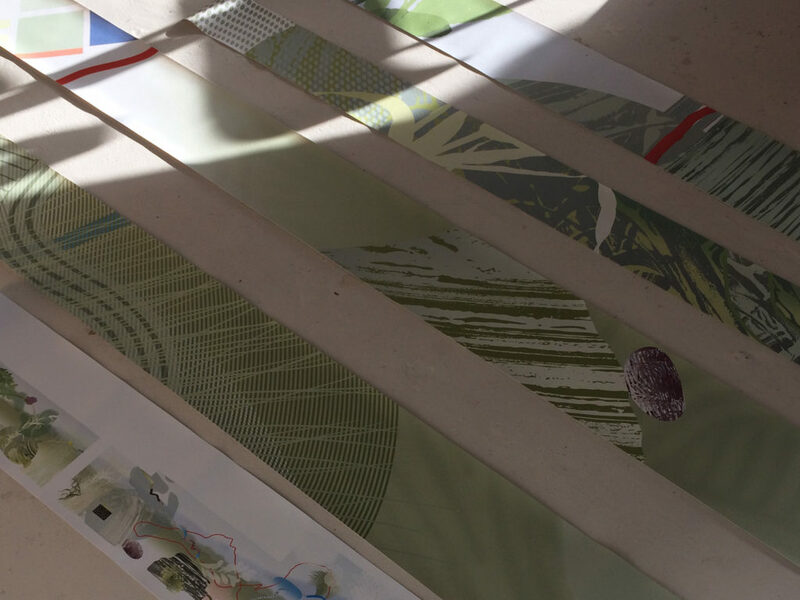 A large vocabulary of individual landscape inspired elements were developed for the project, using documentary photographs taken on my walk with Stewart & further drawings and studies made in the studio. 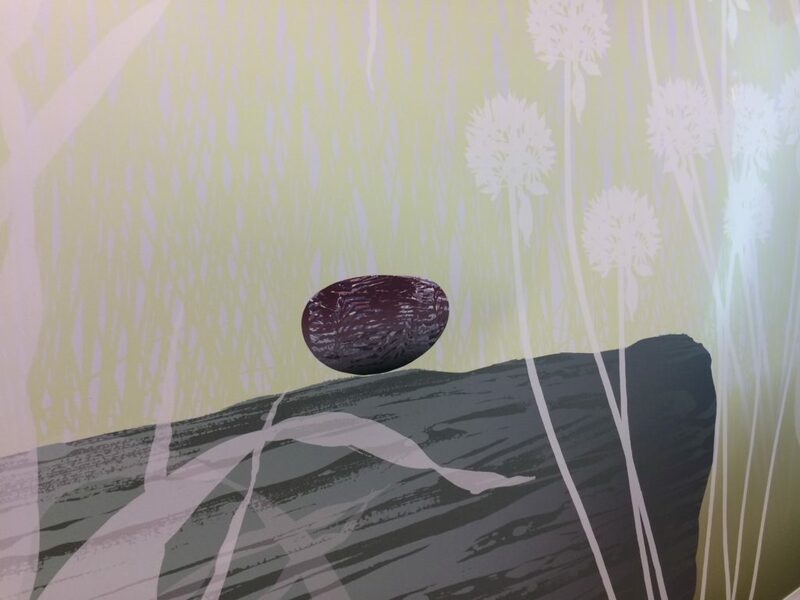 As per usual in my practice, some of this iconography is part of a common language of ideas which appear throughout my work – some are original to this project, some may find their way into the next project. 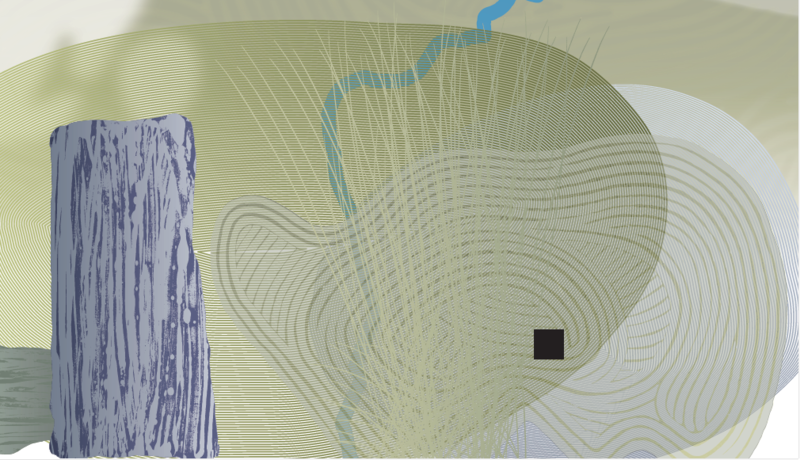 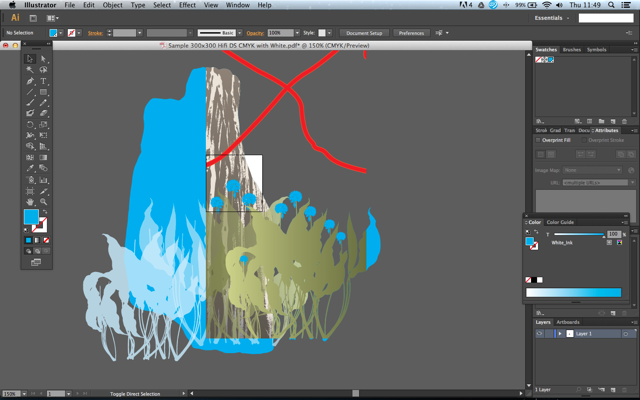 Some have migrated from a previous project. 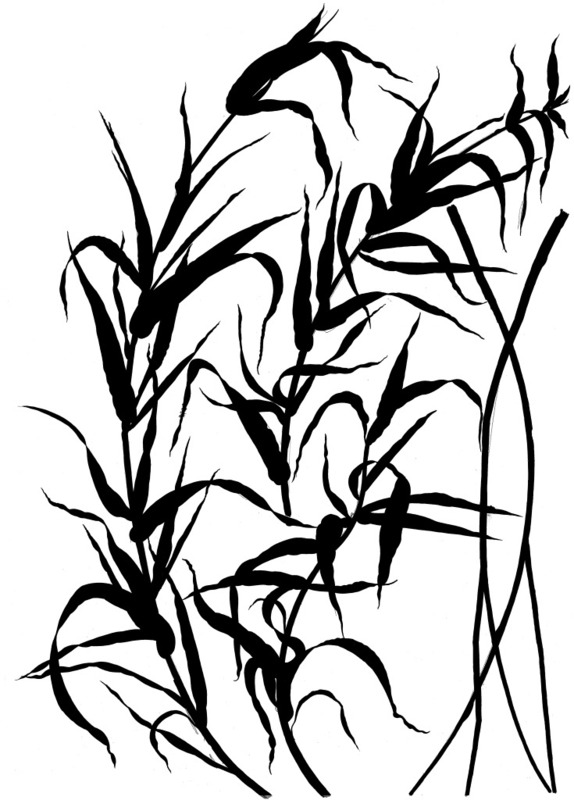 This is my original ‘handwriting’, and may offer clues to the driving elements which fuel my approach to any work. 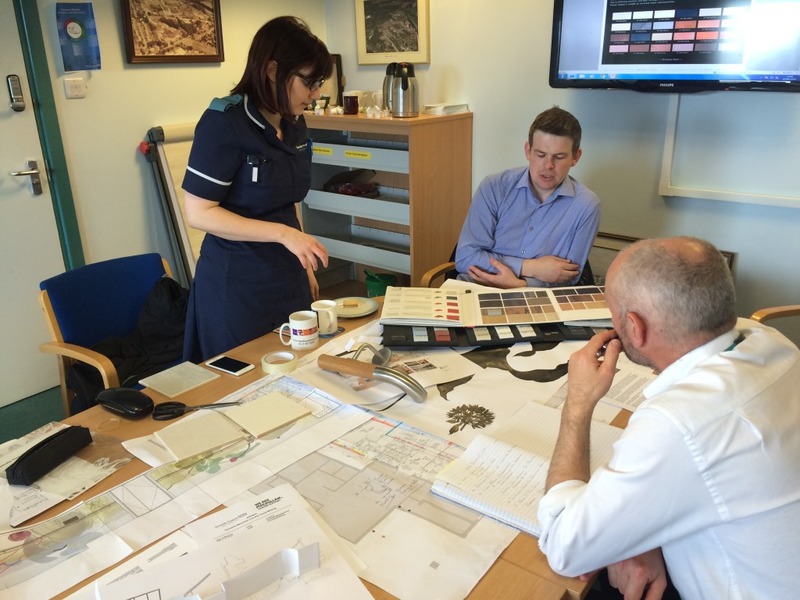 The project was also featured online this week by Building Better Healthcare. 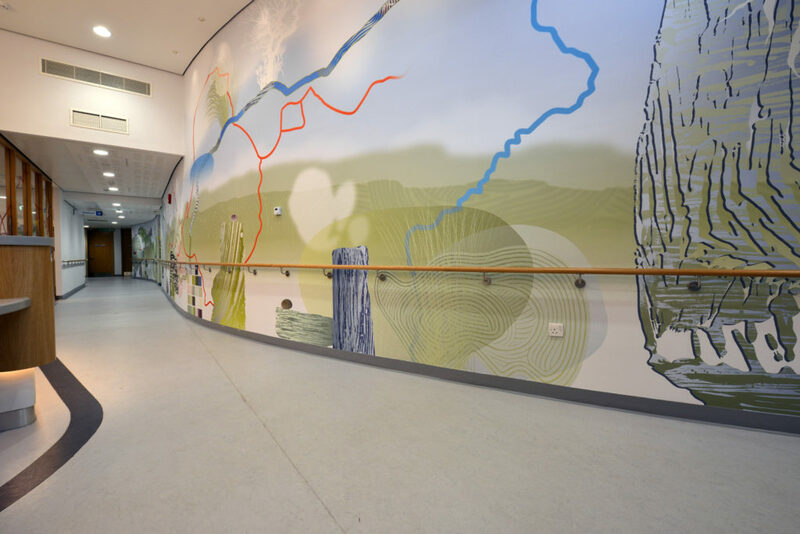 Stewart Ramsden is a member of the TMU Art Group as a Patient Representative. 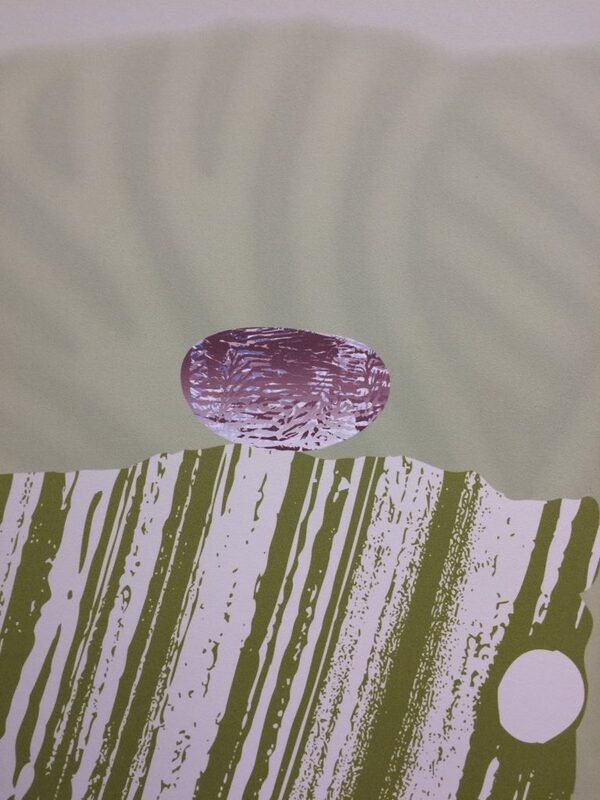 Stewart also happens to be the President of the Tameside Ramblers. 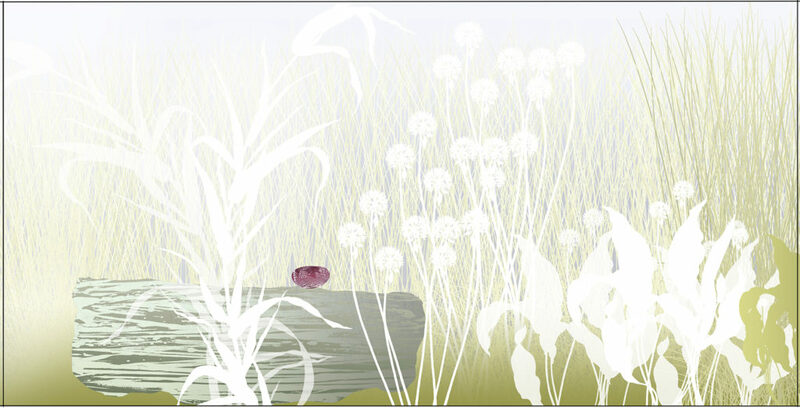 He accompanied me on the 12 mile walk in Tameside, which has been the inspiration for this project. 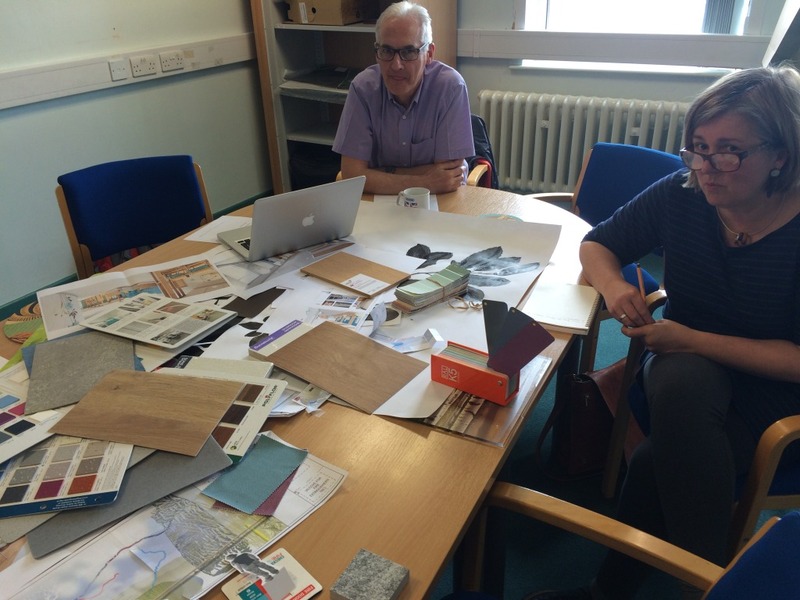 Bronwen Gwillim is Creative Director at Willis Newson and is leading on the Arts and Interior Strategy for the Trust. 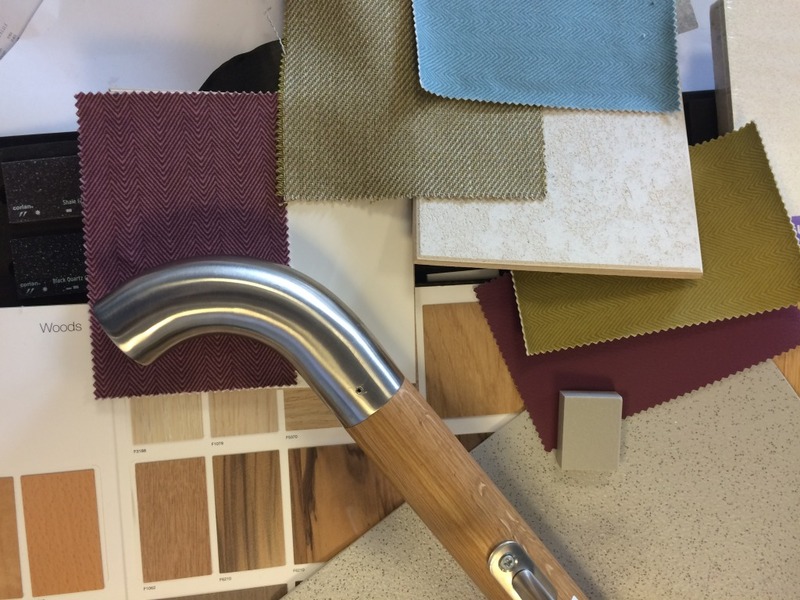 The meeting also covered the proposals for colour, fabrics and finishes for the Interiors of the building, which is being delivered by Michael Hughes, IBI Group Project Architect. 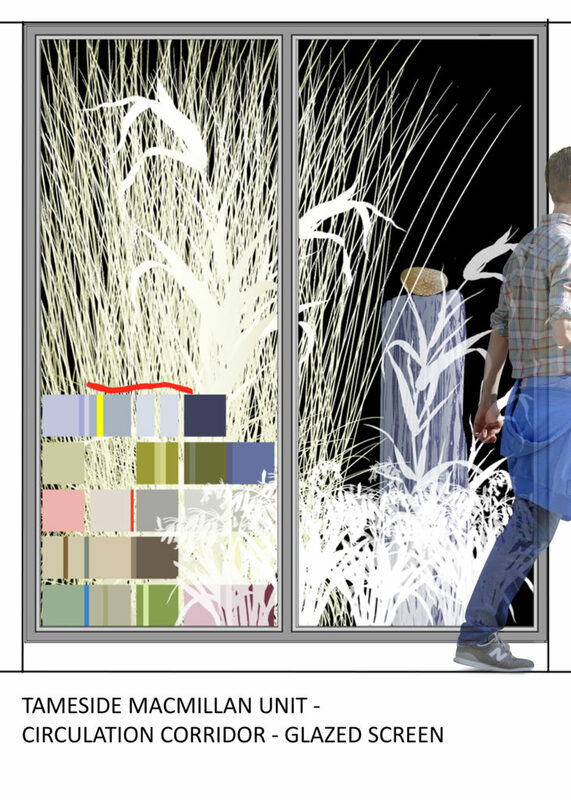 I am also consulting with Olivia Kirk of Olivia Kirk Gardens who is designing the external courtyard finishes and planting scheme. 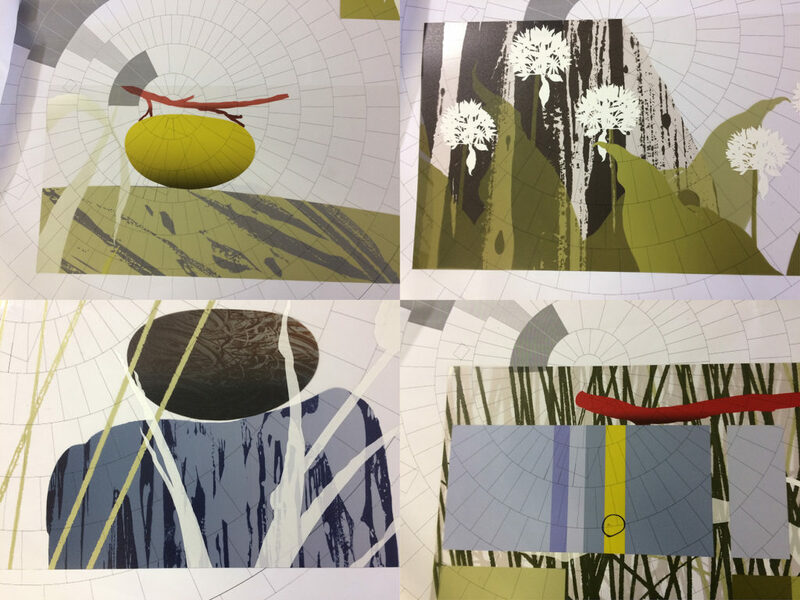 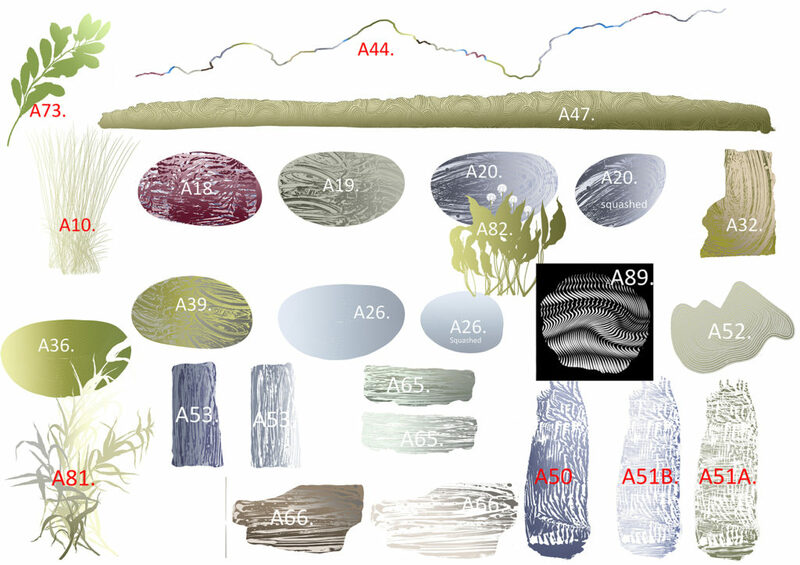 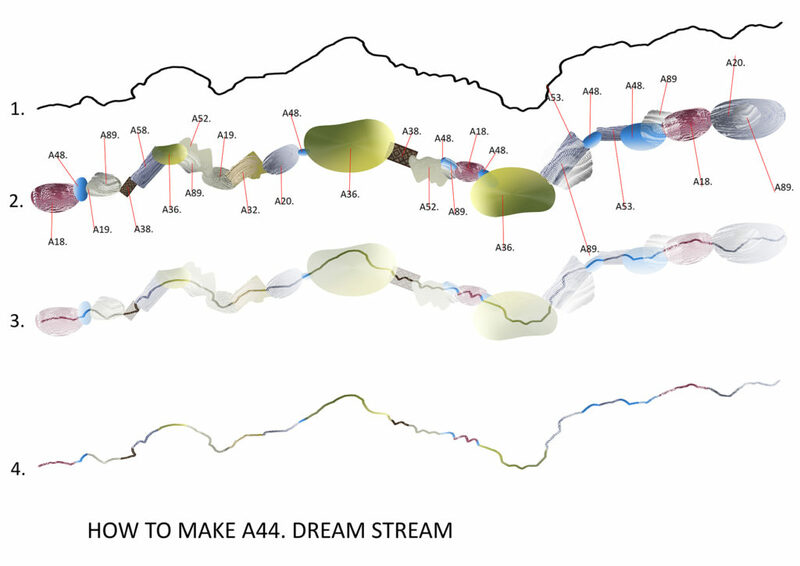 It is an interesting collaborative process – as I am responding to and being inspired by their proposals for colour, texture and materials, whilst my draft artwork is also influencing the colour field and aesthetic for the project. 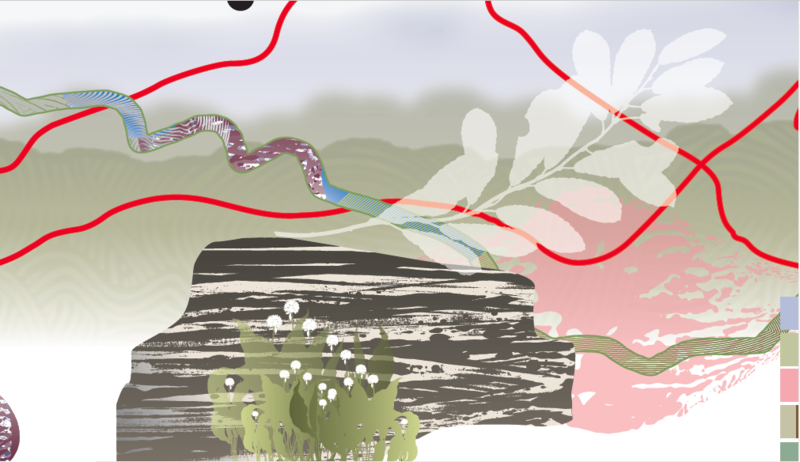 Stewart Ramsden, my walking partner compiled the walk – one he has done many times before. A Stewart Ramsden ‘Ramtrails’ walking route – Wild Bank and Hollingworthall Moor from Godley, Tameside. 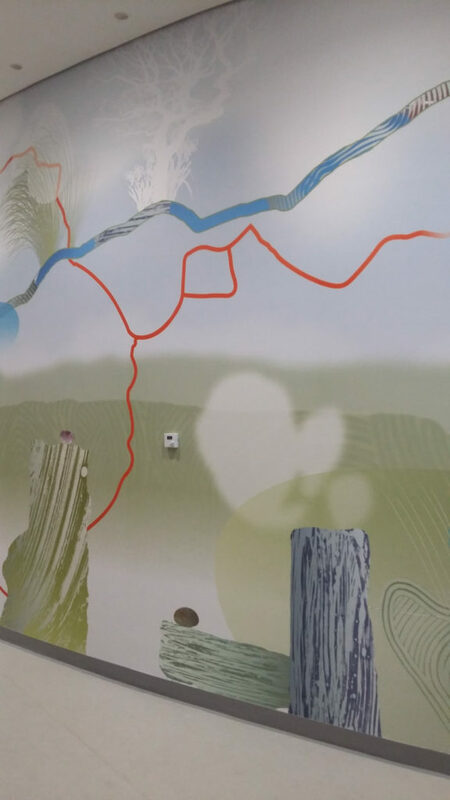 Our route was eventually described by an eccentric figure of eight. 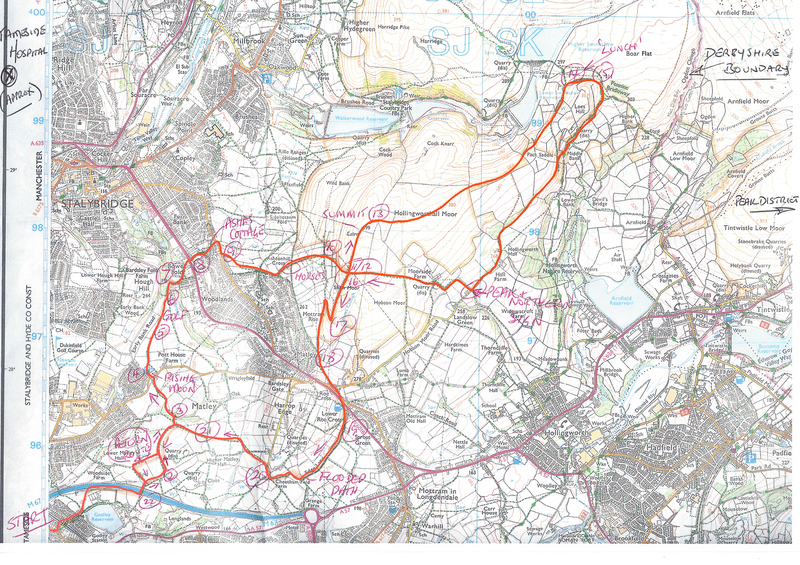 Wild Bank and Hollingworthall Moor from Godley – a 12 mile walk through town, suburb, farmland and moorland.